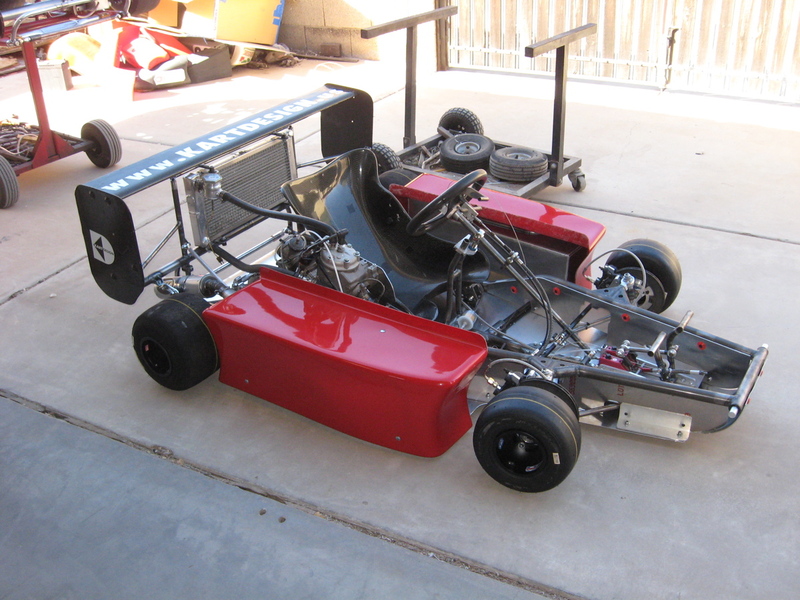 Benn Herr (Kart Design) started racing in 1971, short break for a few years at the end of the 70’s. 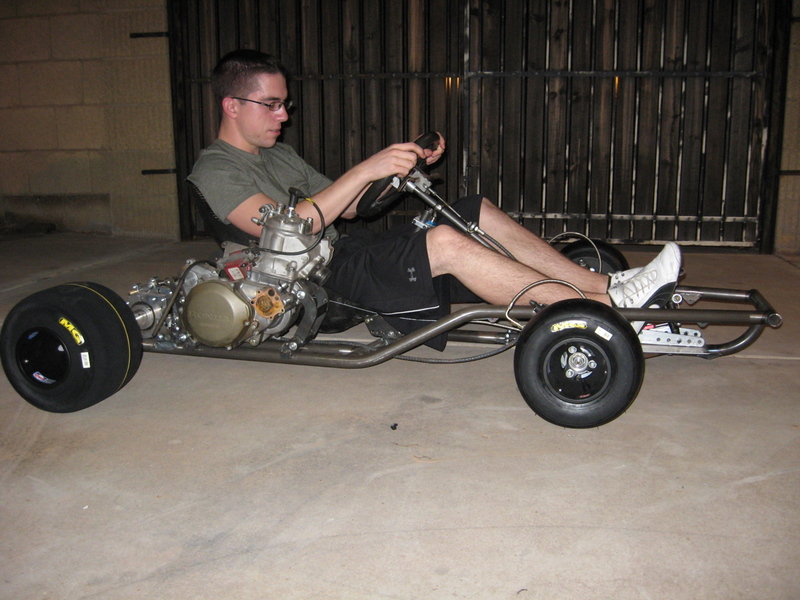 Have run just about all types of karts. 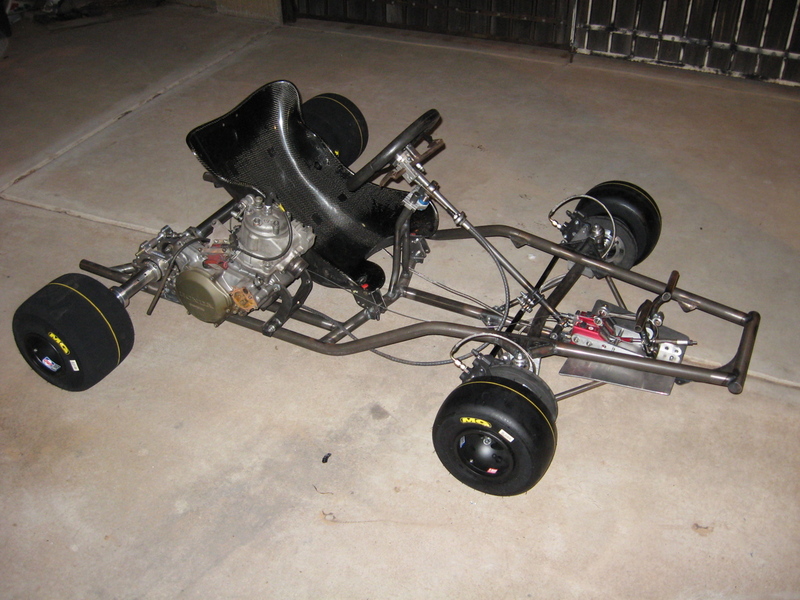 Built my first kart in the late 80’s. 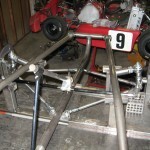 This one will be my 10th. 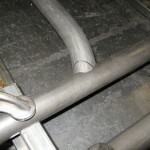 Learned something from each one. 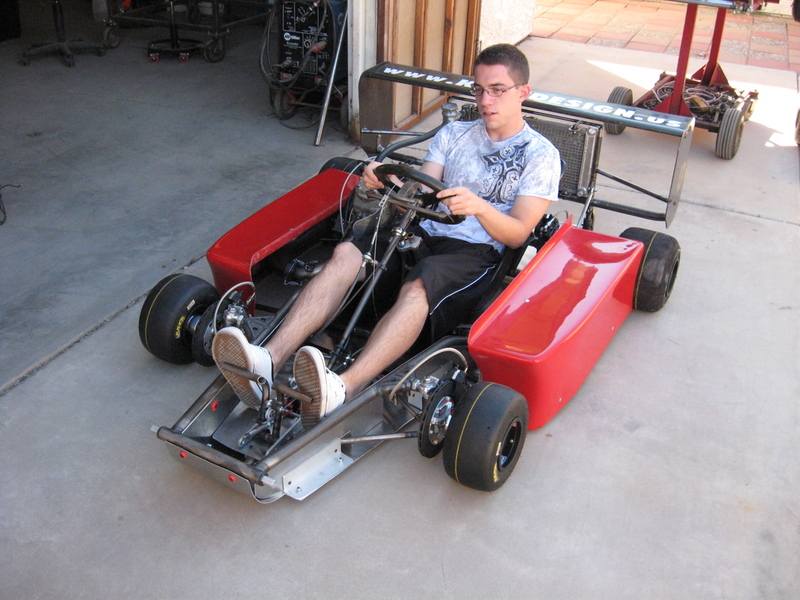 The kart is intended to be a “Short Track” ICE type Superkart. 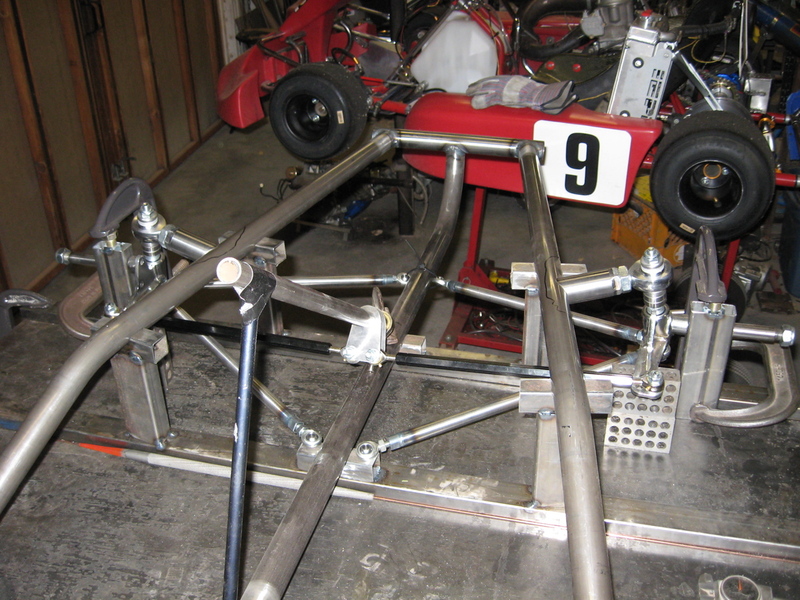 Most of our tracks are under 1.3 miles long and work best with CIK style Sprint karts. 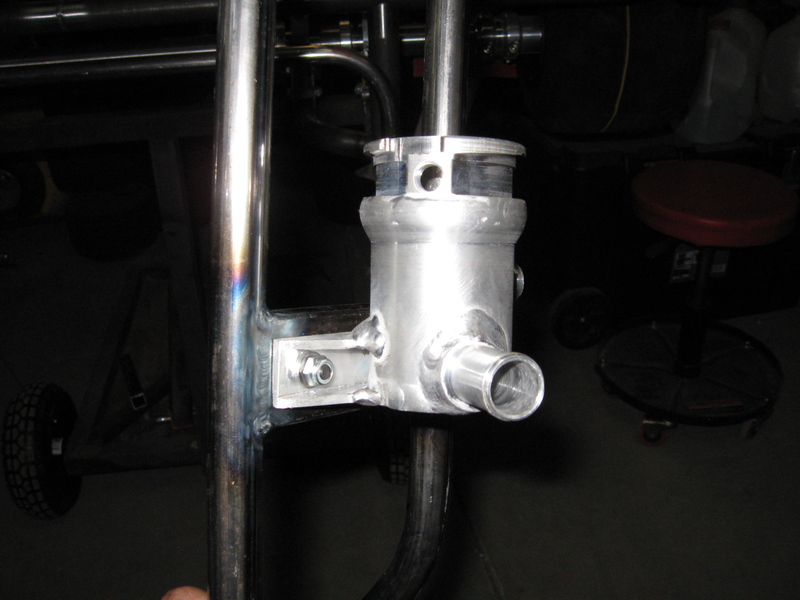 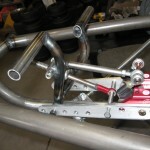 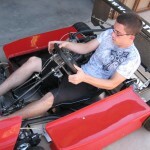 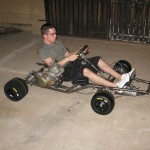 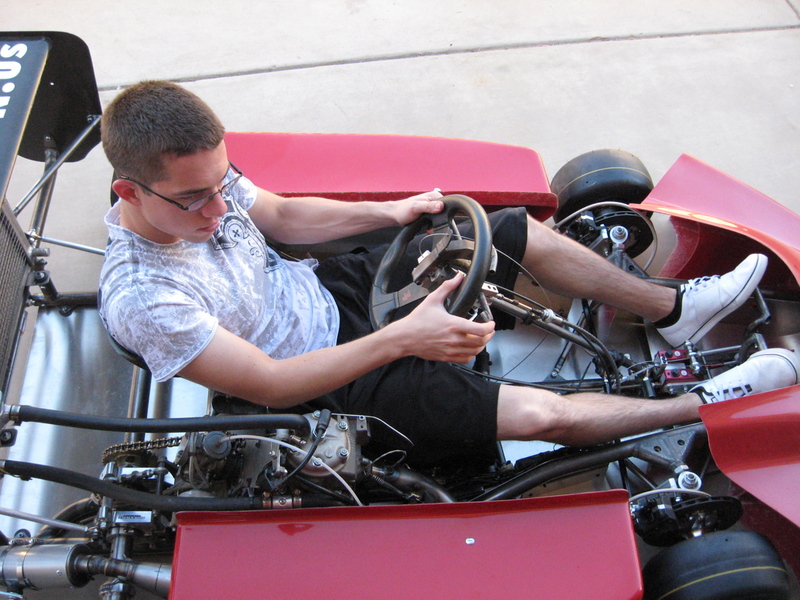 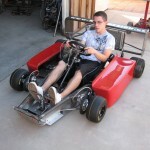 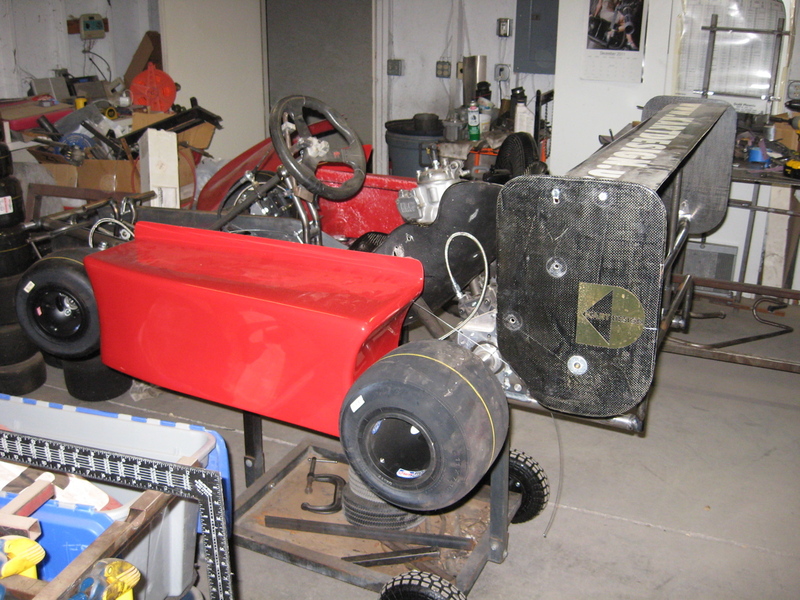 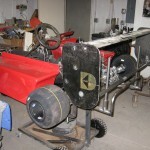 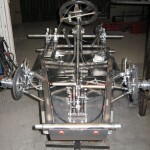 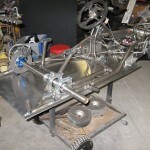 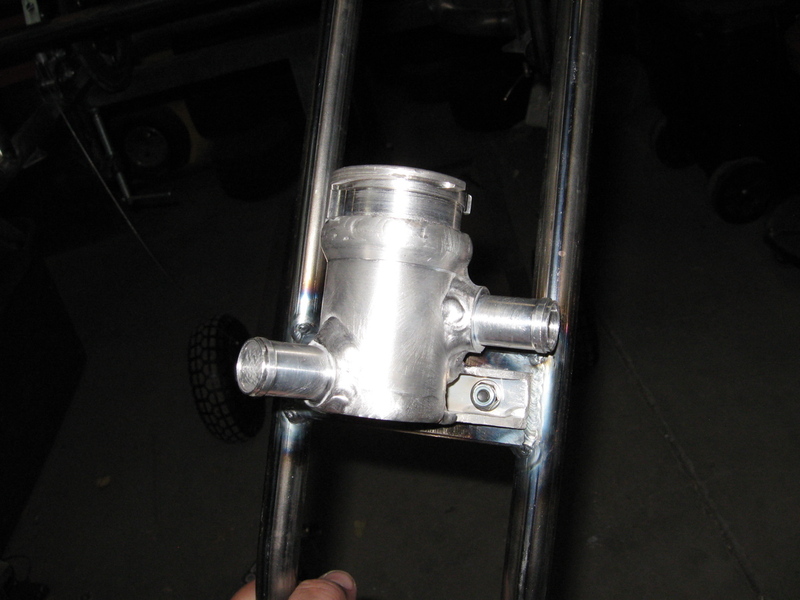 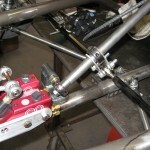 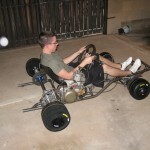 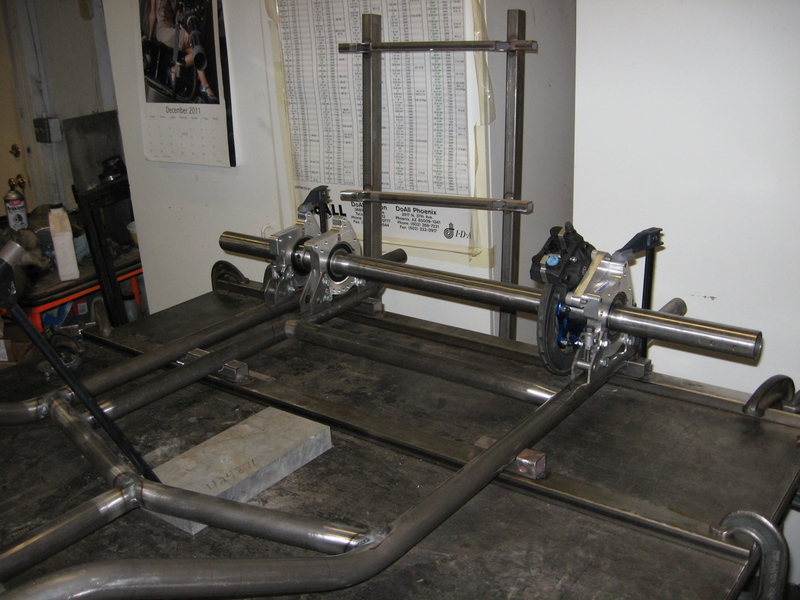 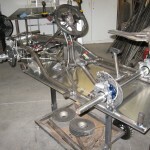 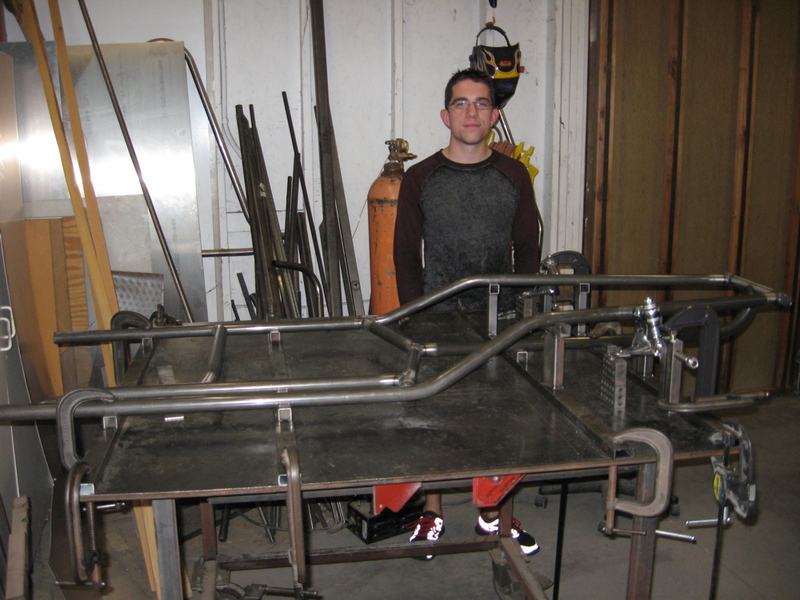 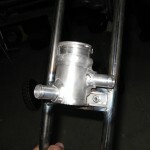 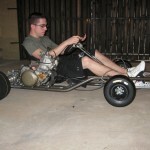 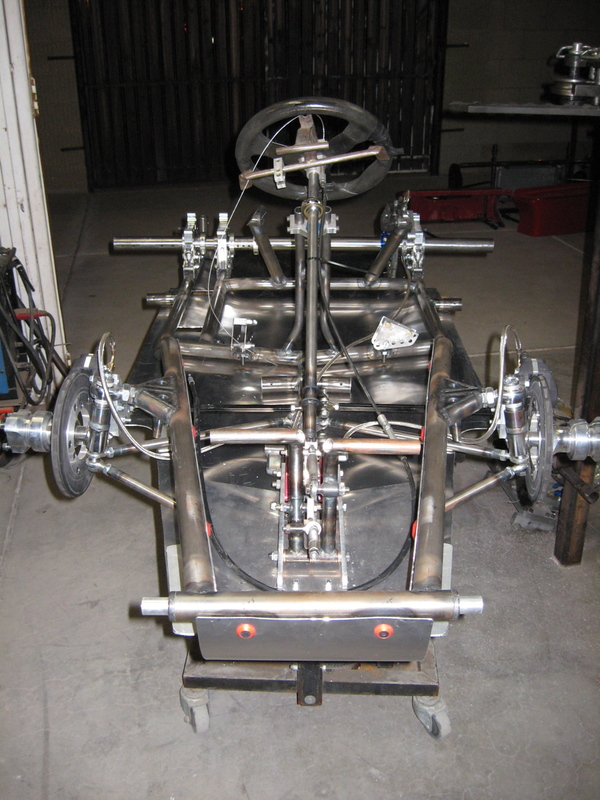 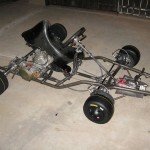 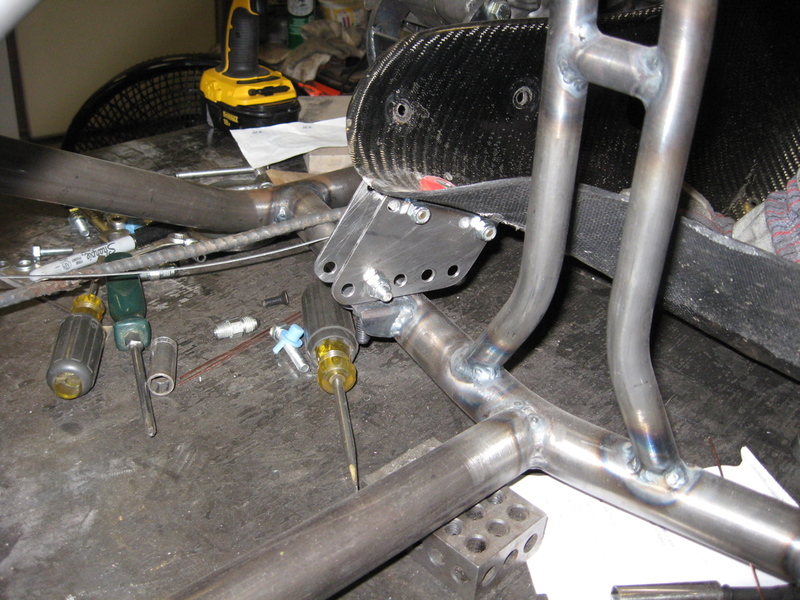 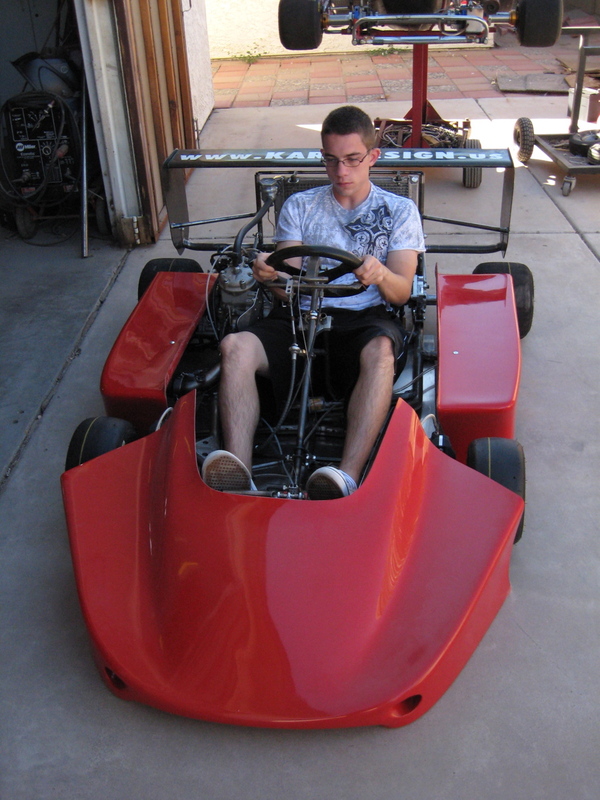 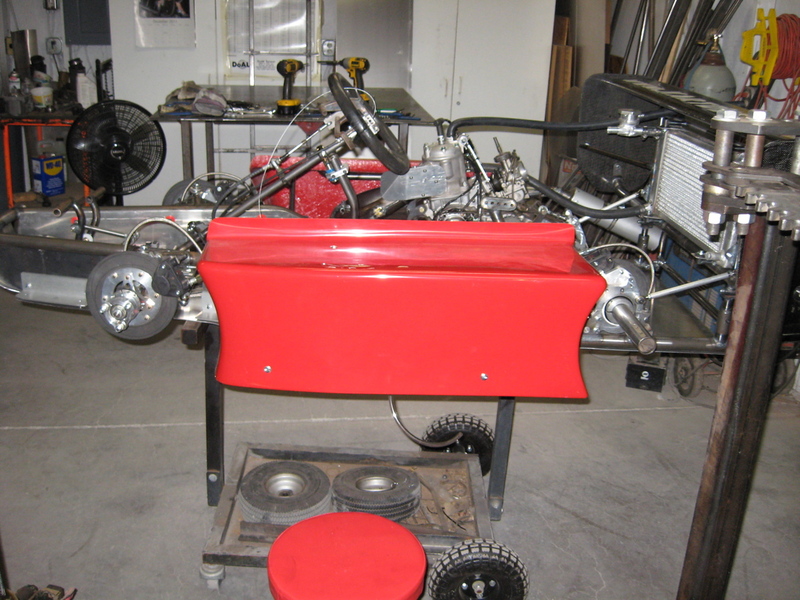 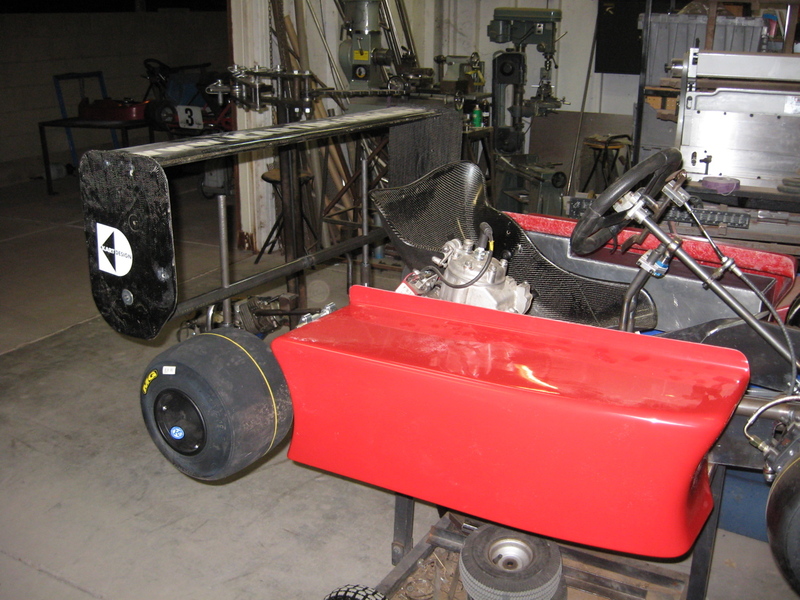 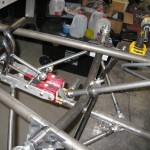 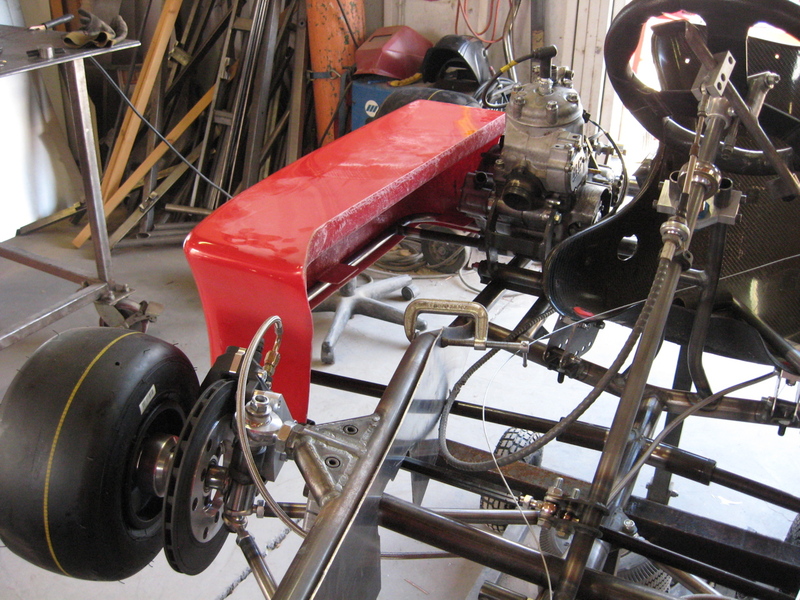 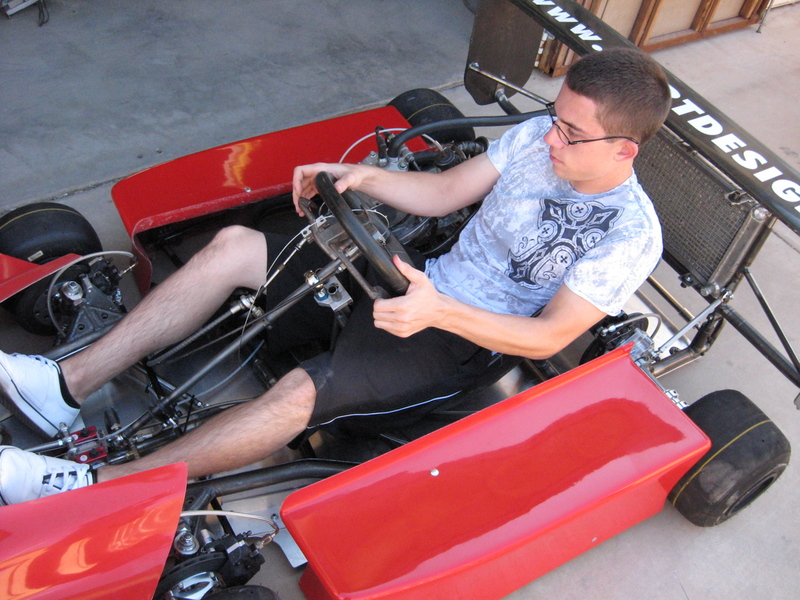 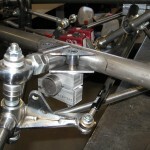 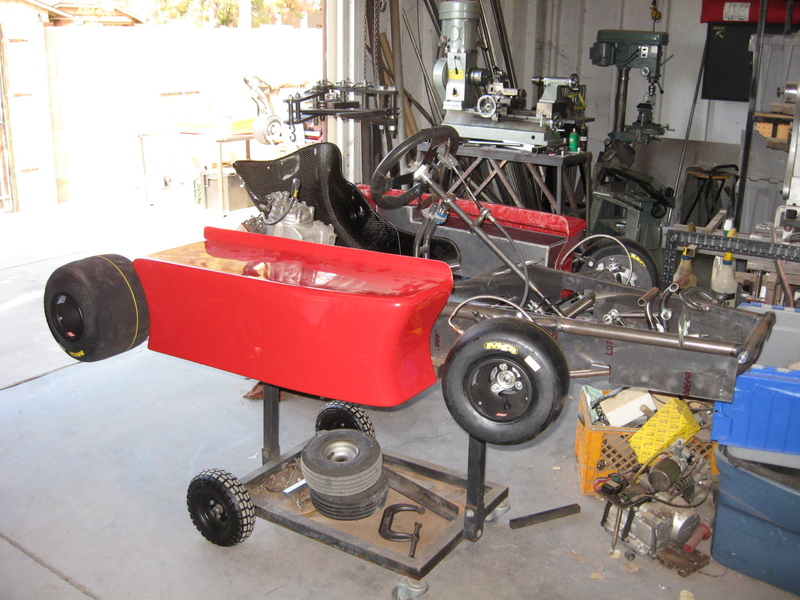 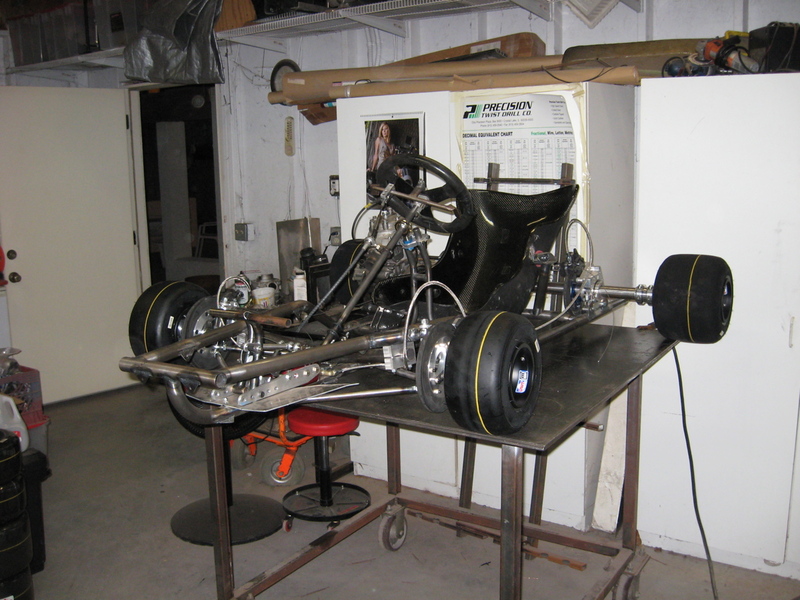 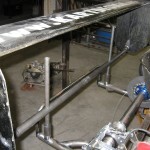 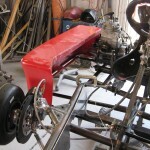 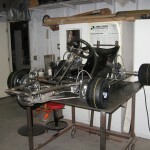 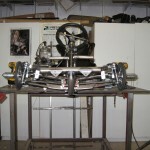 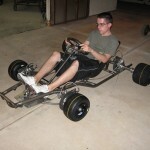 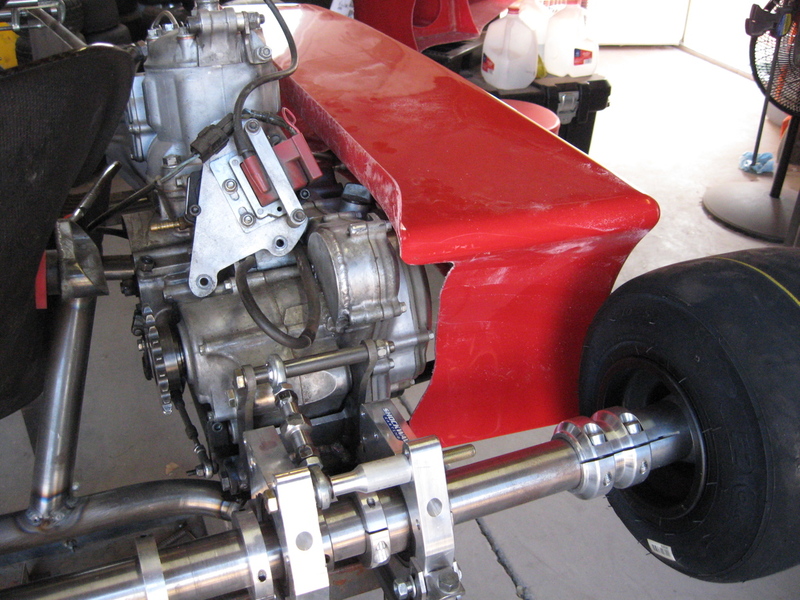 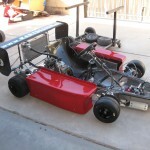 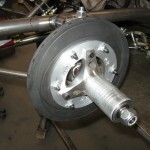 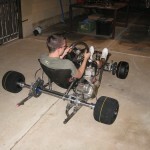 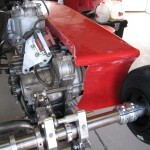 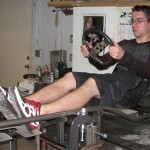 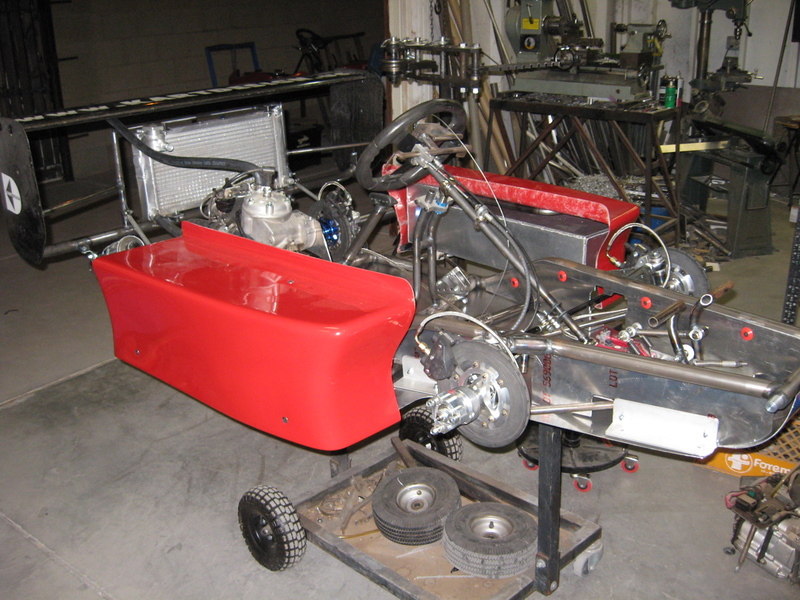 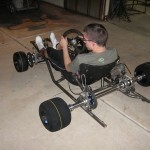 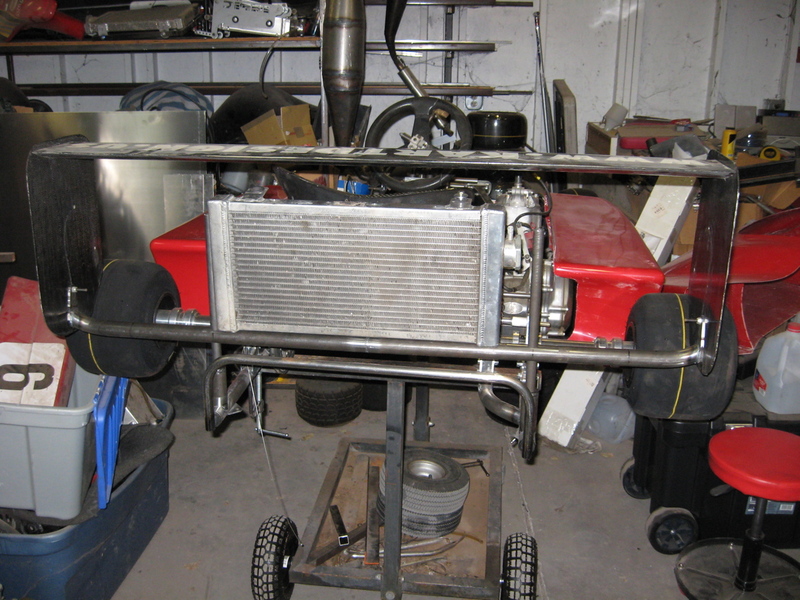 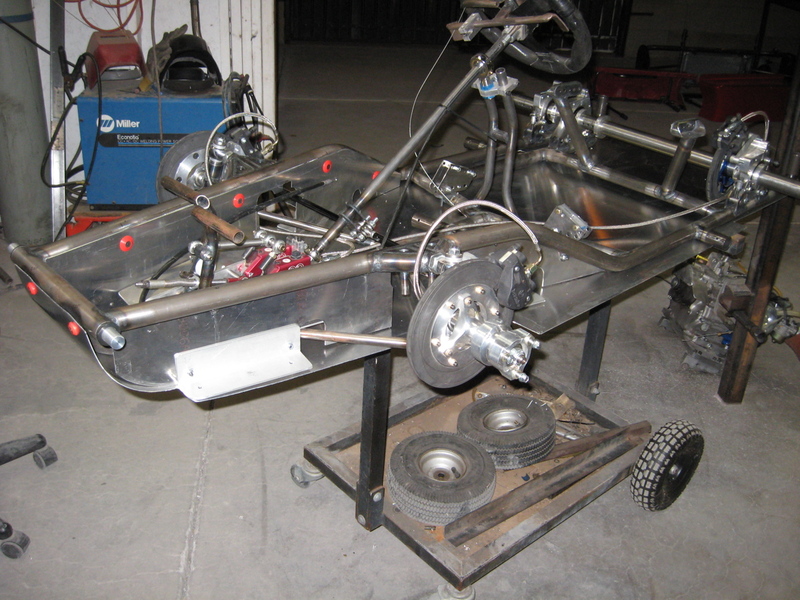 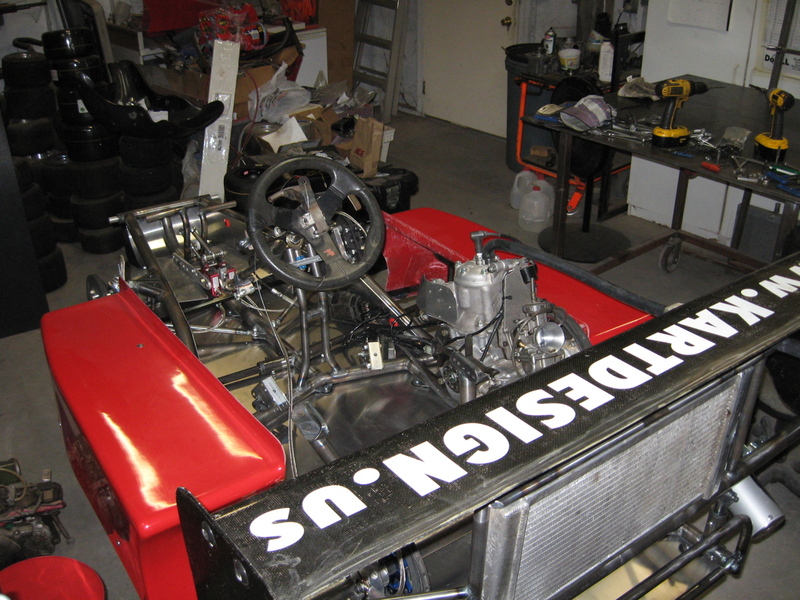 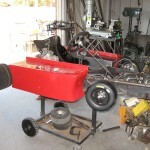 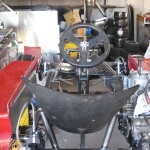 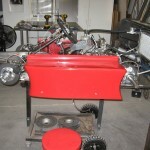 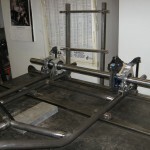 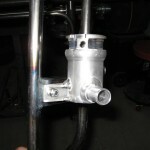 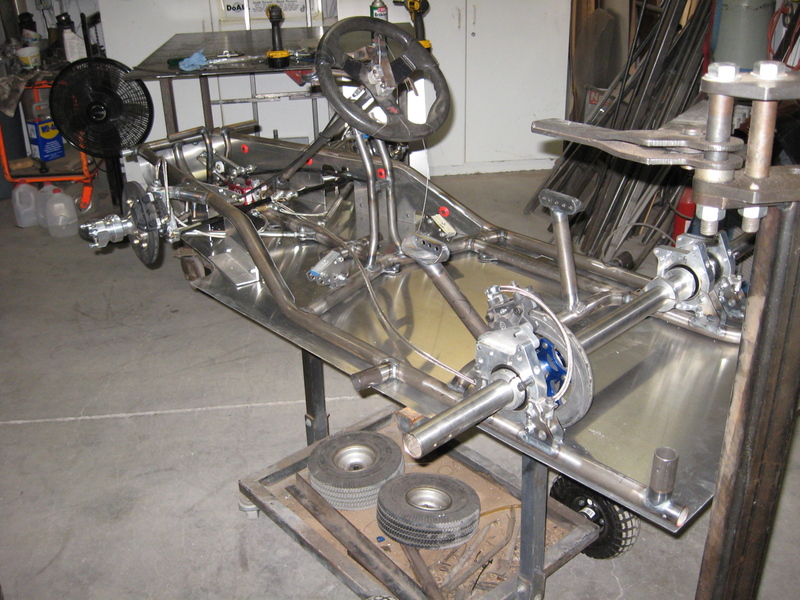 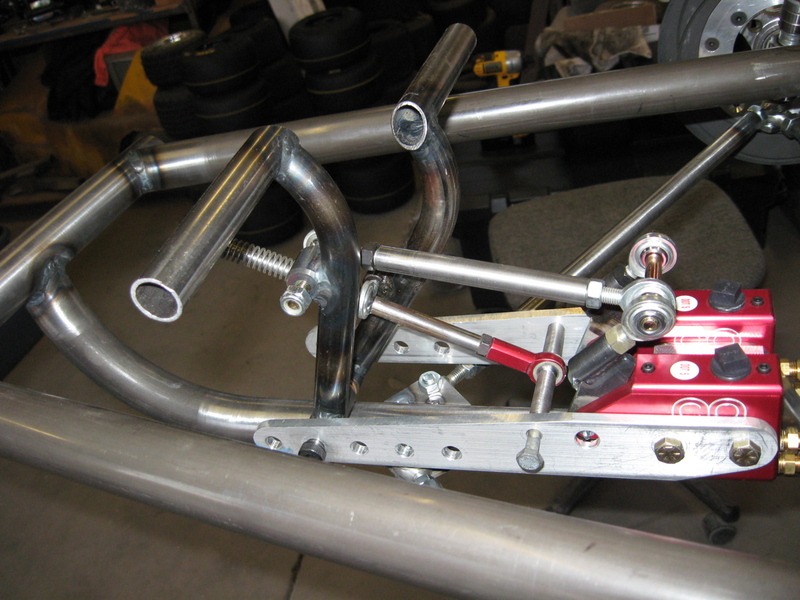 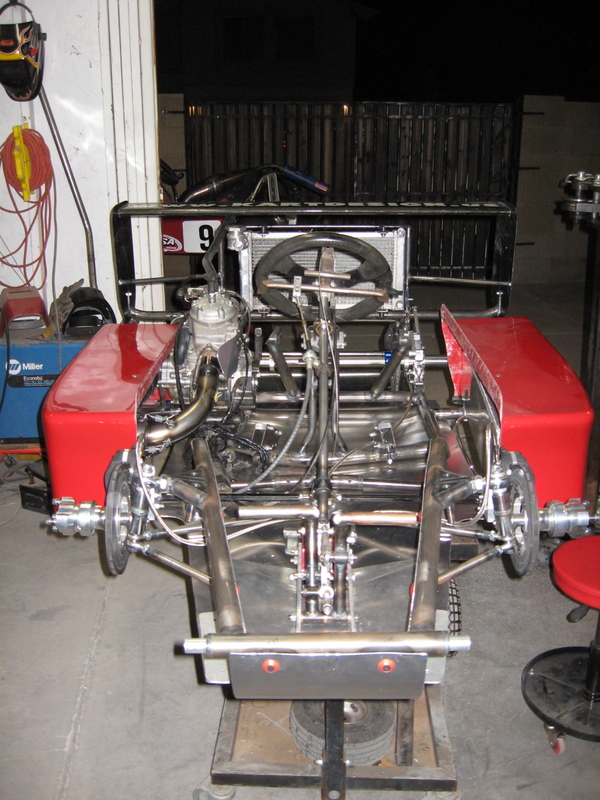 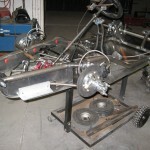 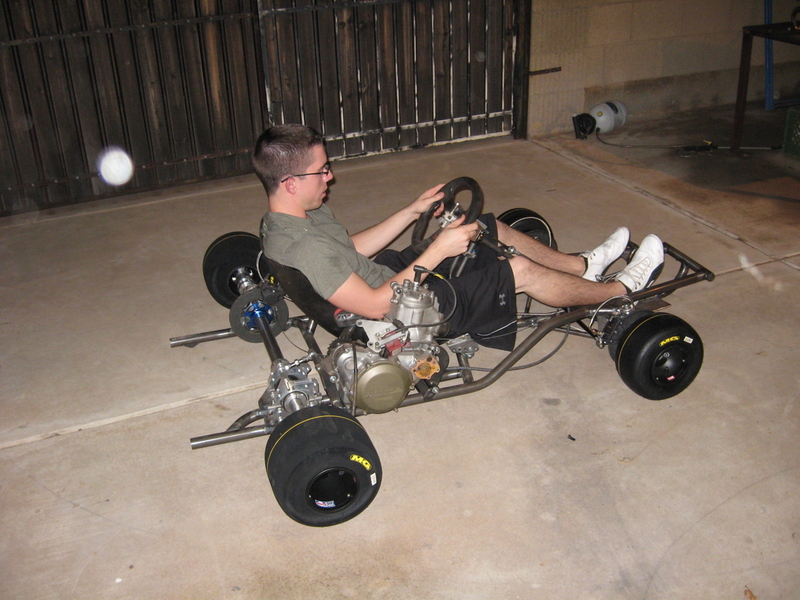 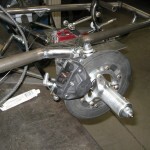 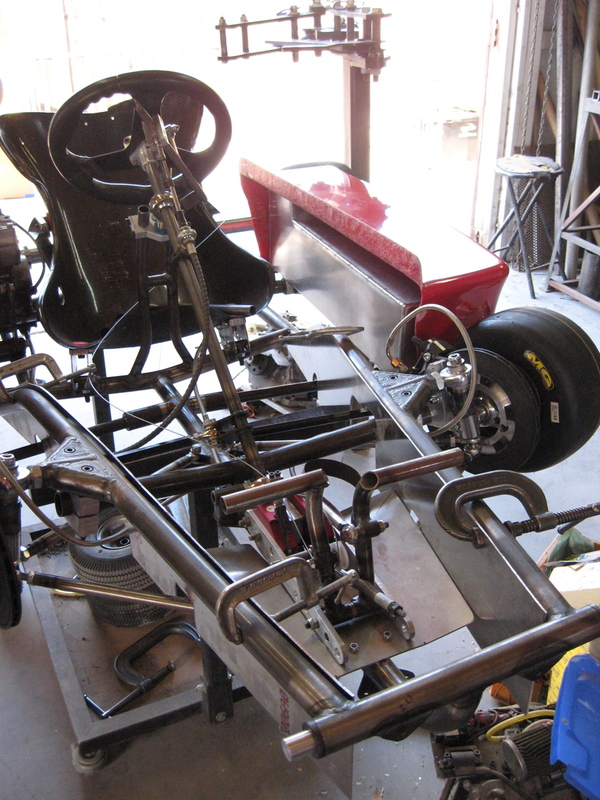 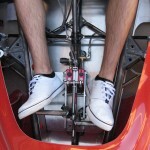 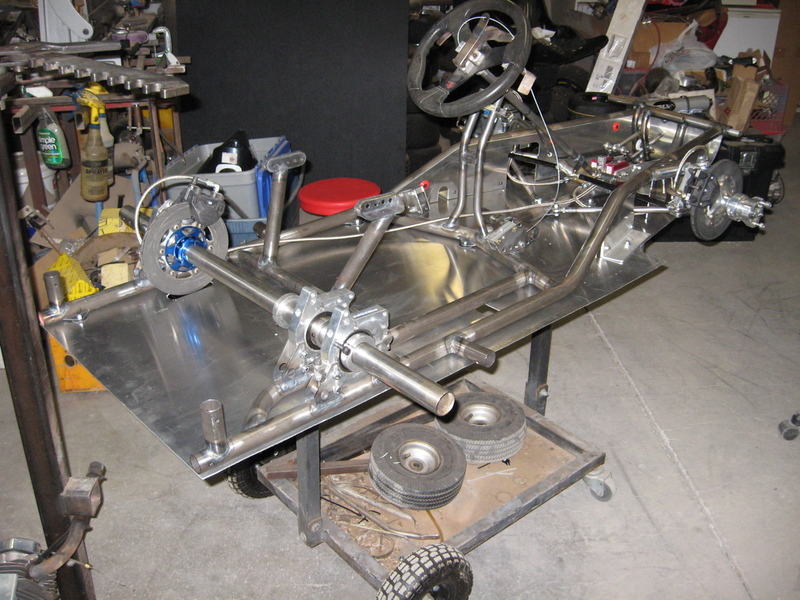 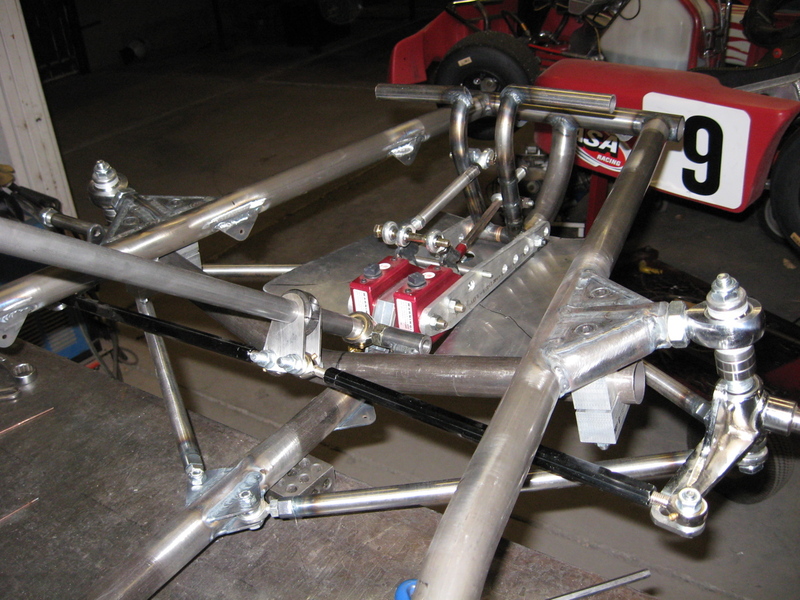 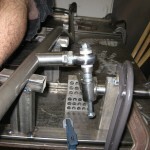 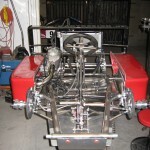 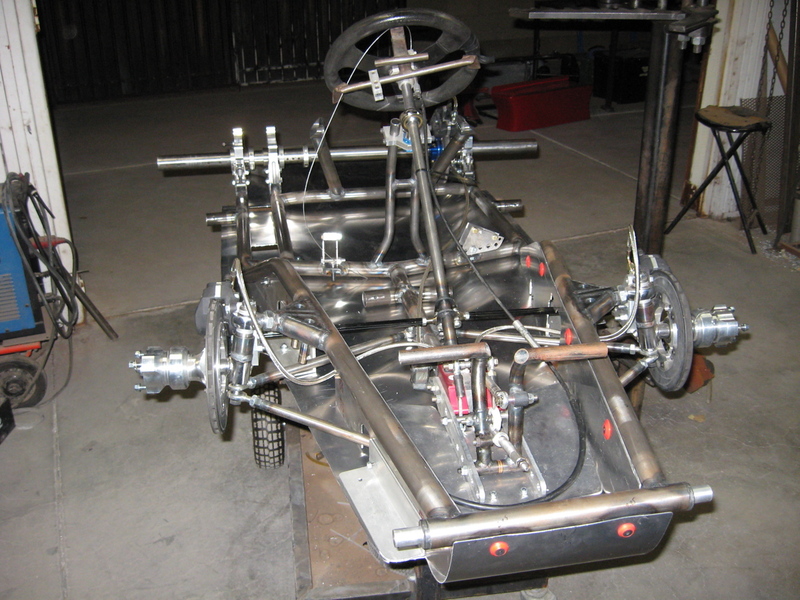 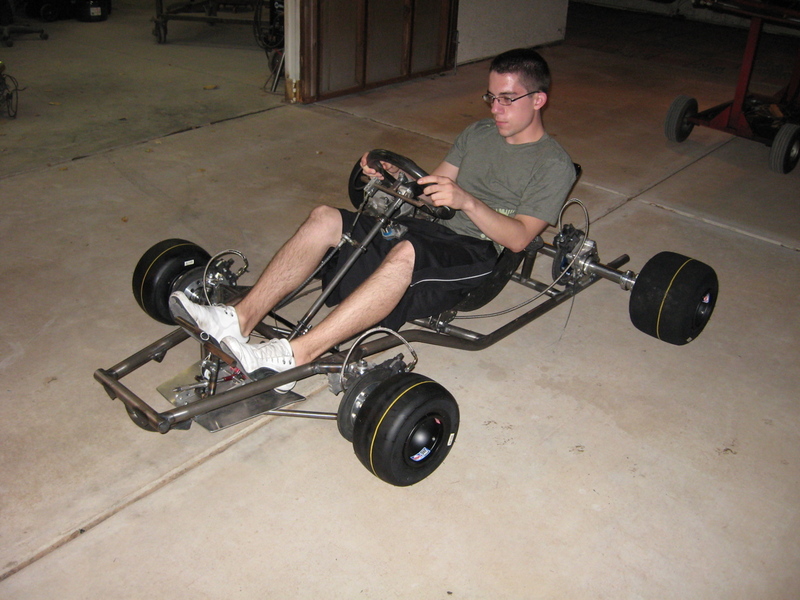 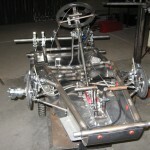 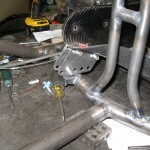 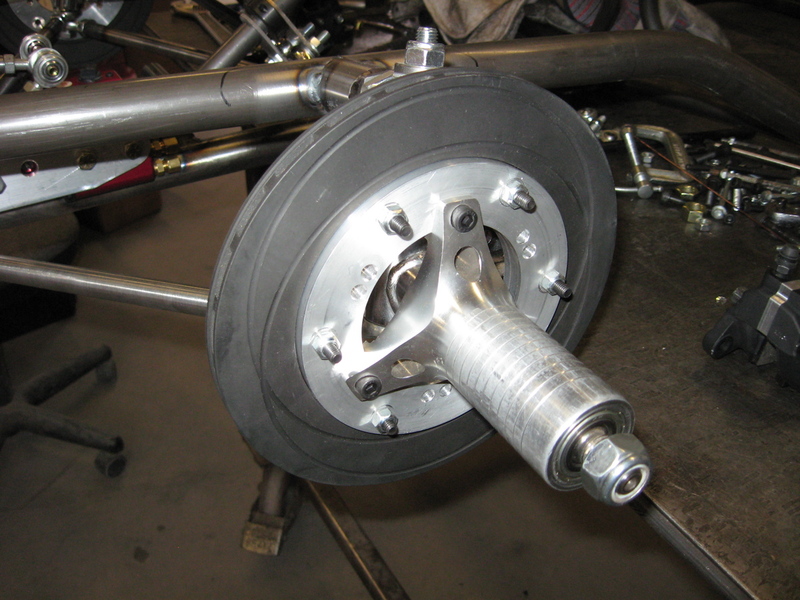 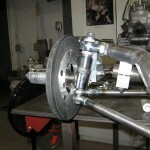 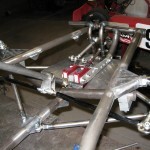 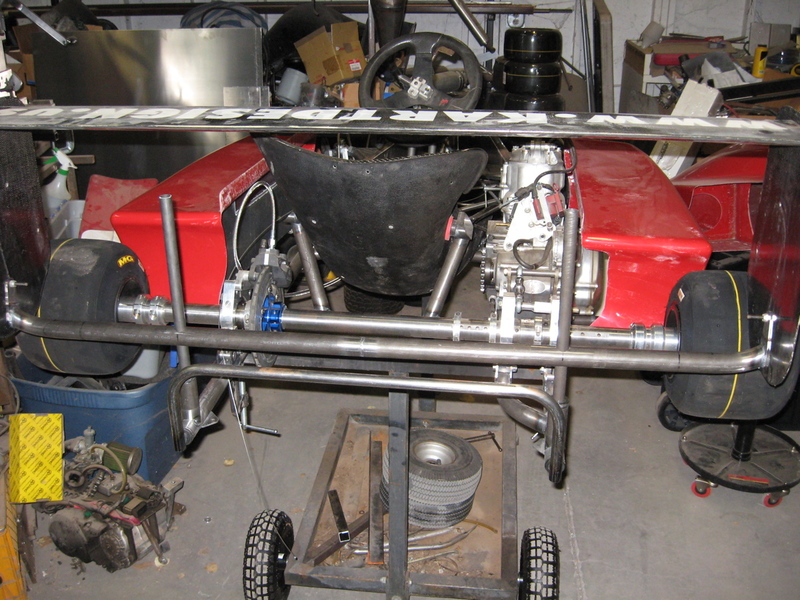 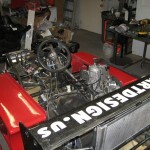 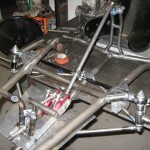 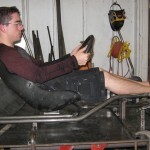 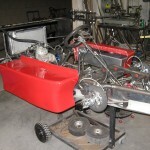 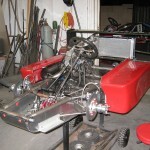 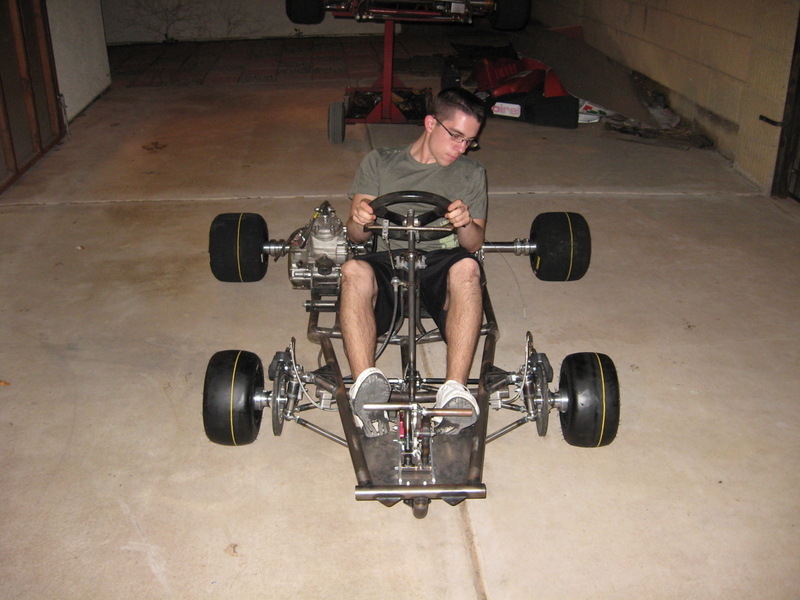 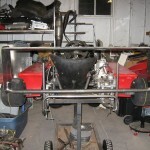 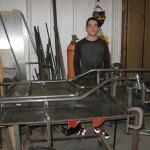 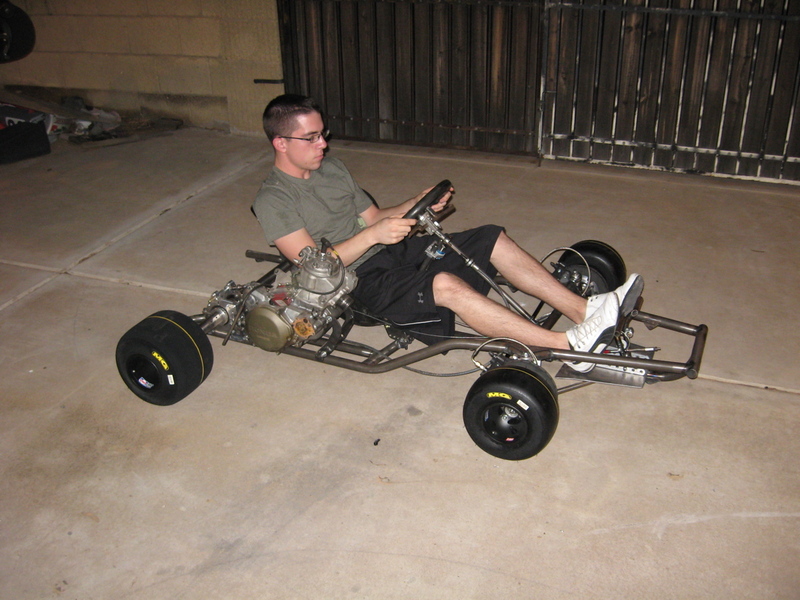 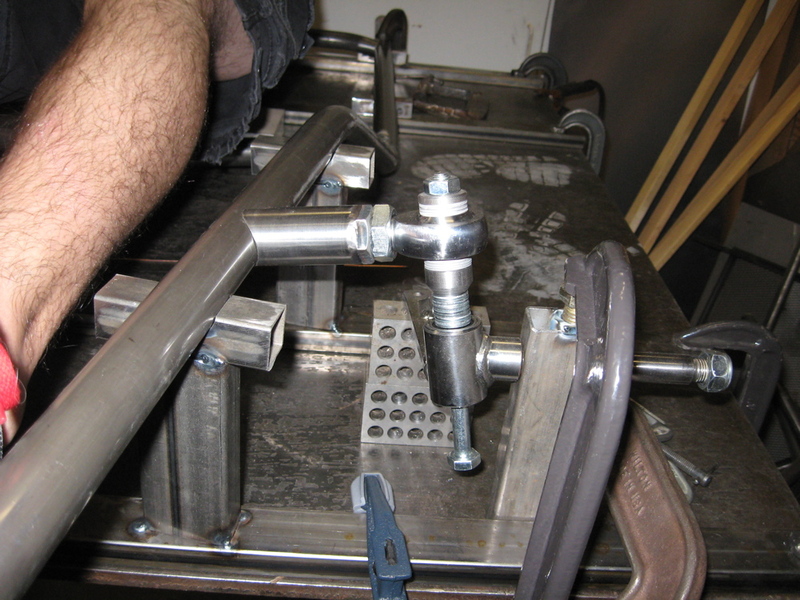 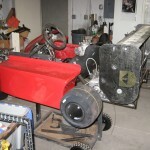 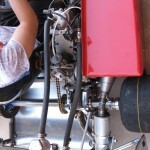 The wheelbase is just over 43 inches, the minimum for most organizations that run Superkarts. 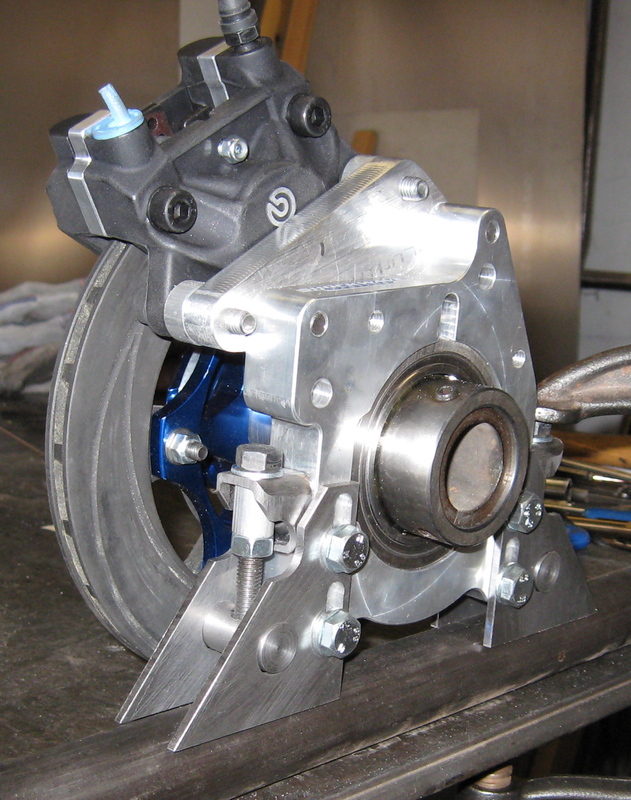 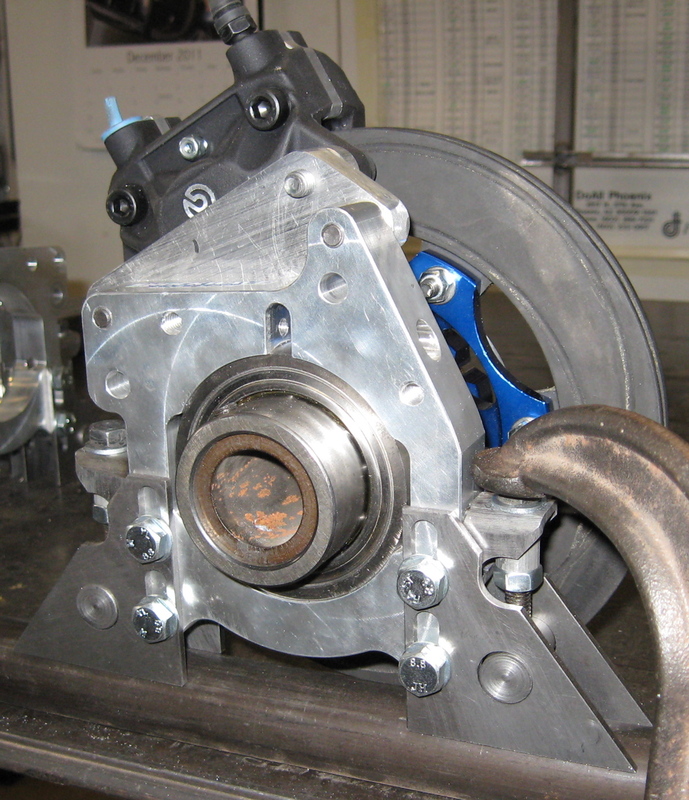 The brakes have a great deal of over capacity to be able to deal with engines up to 500cc capacity. 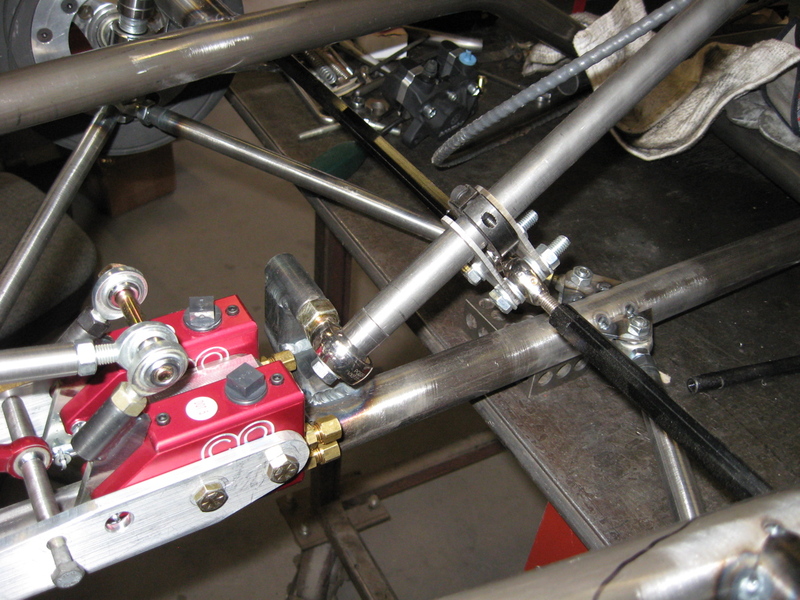 Much of the hardware is from Birel shifter karts we have run. 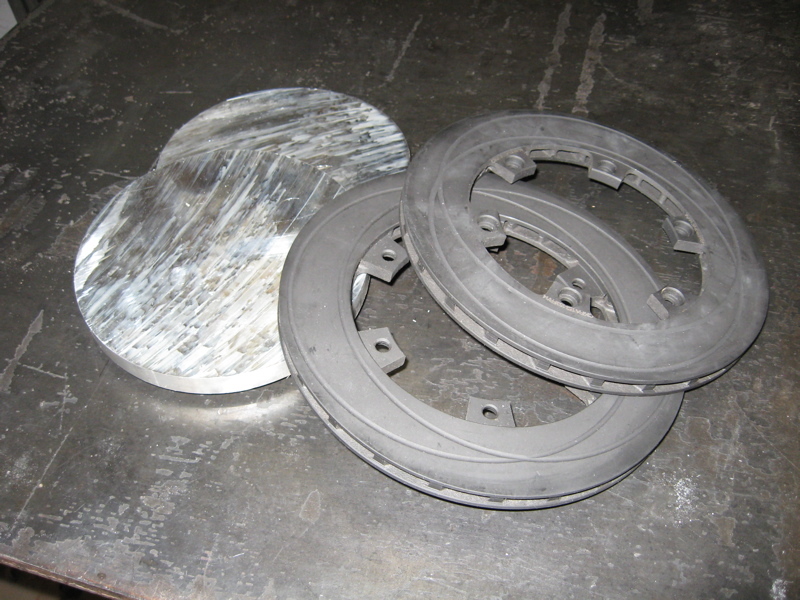 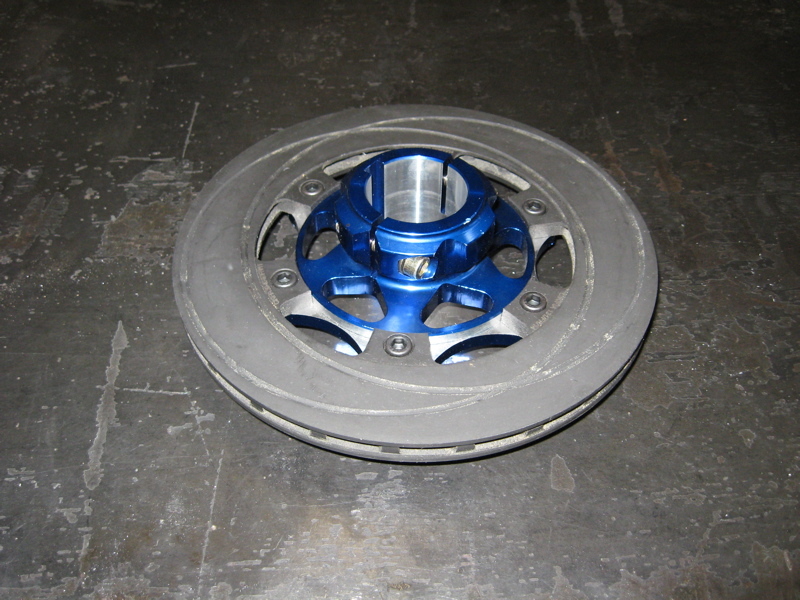 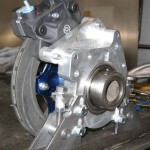 200mm Vented Brake Rotors from Righetti Ridolfi and Brembo Calipers. 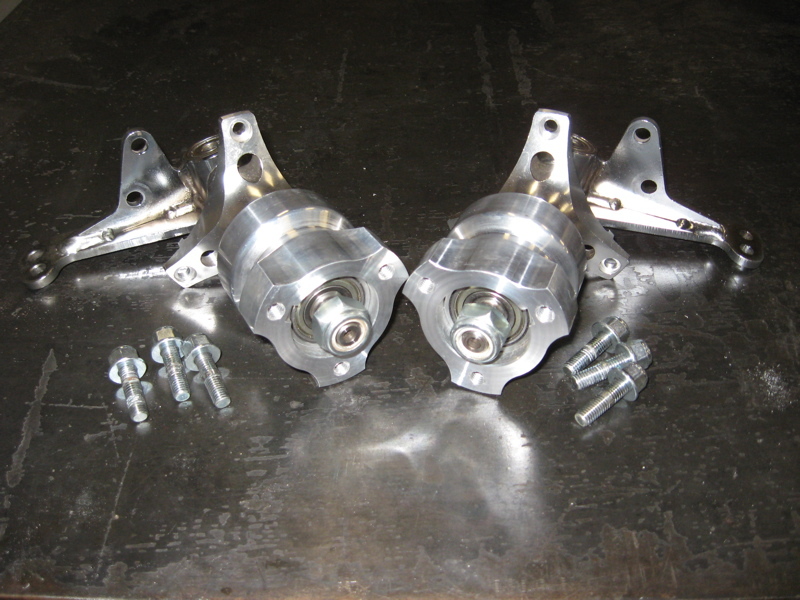 Shockwave Hubs and Cassets. 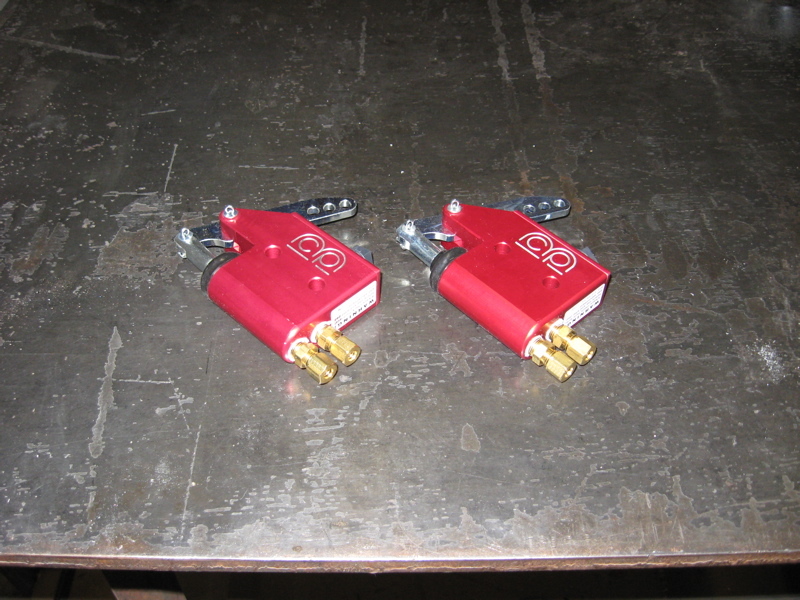 MCP Master Cylinders. 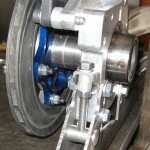 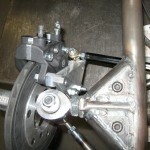 Upper Ball Joints. 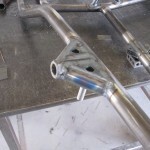 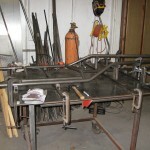 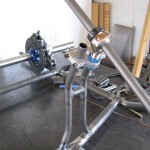 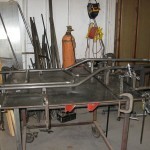 A few picture of the jig as it comes together. 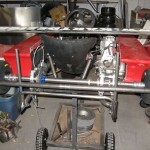 More pictures as I get some tubes fitted. 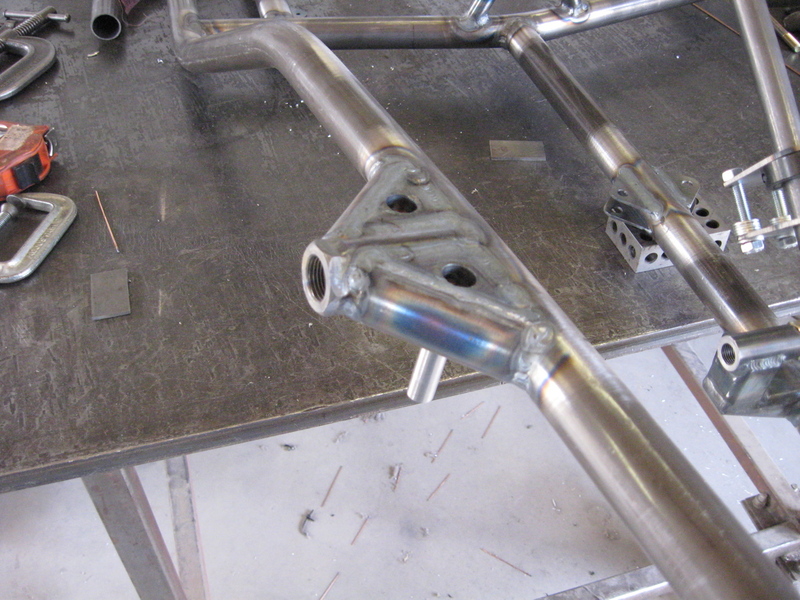 Got all the major notching and fitting done. 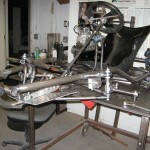 Have to do some fine tuning and make some of the smaller parts. 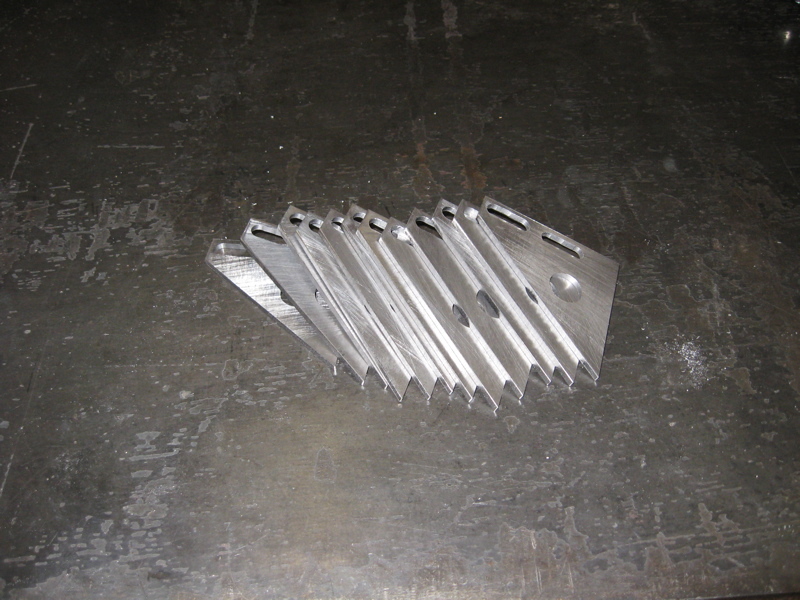 I love using a mill to do the notching! 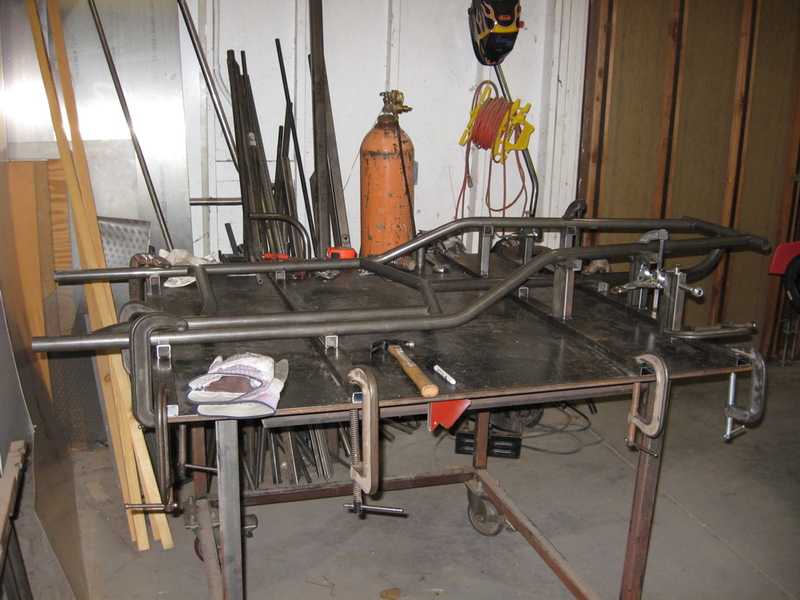 Frame is about 75 percent welded. 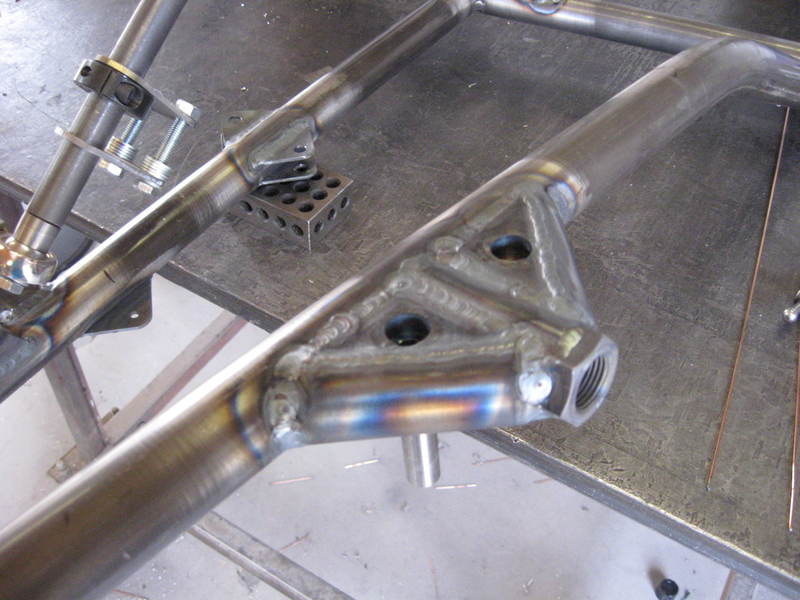 Tacked it together in the jig and then pulled it out to do the full weld on the joints. 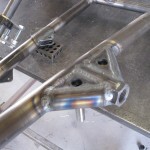 It welded easy and then when I set it back on the jig it went in with virtually no distortion! 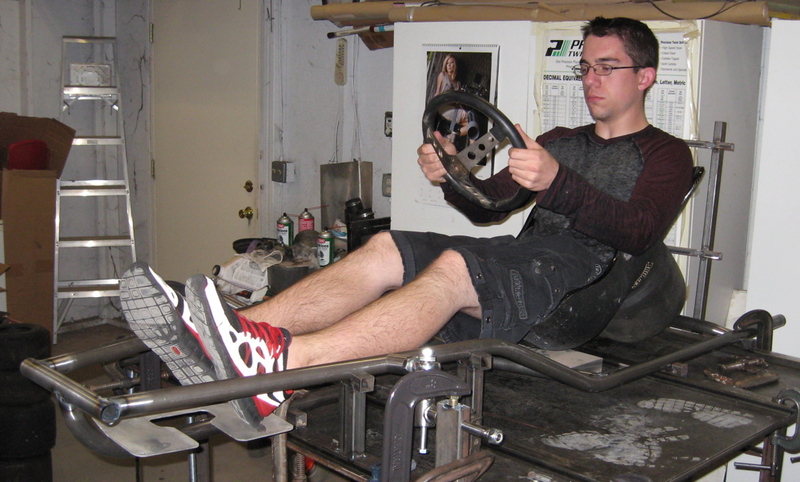 Got the driver up on the table to check the fit, seems to be okay. 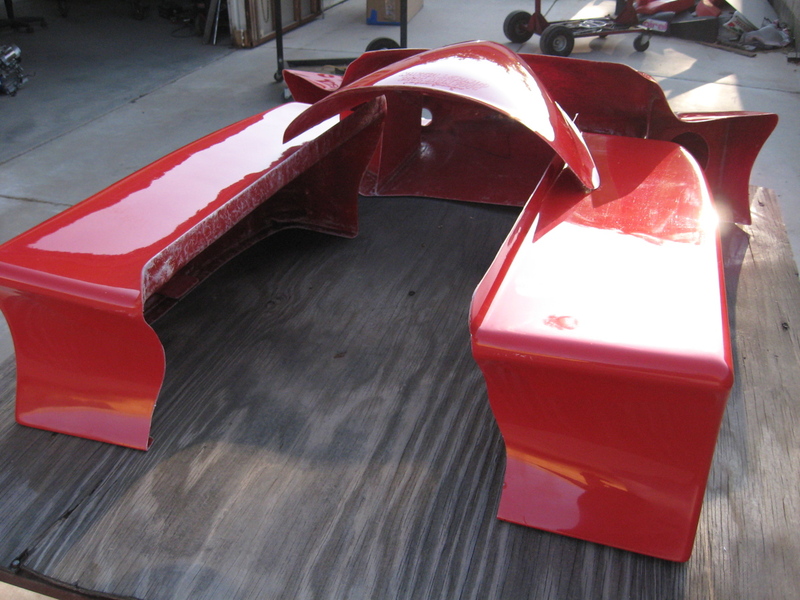 A nice side view. 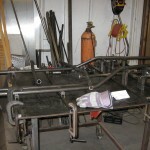 I’ll do a bunch of welding in the next few days. 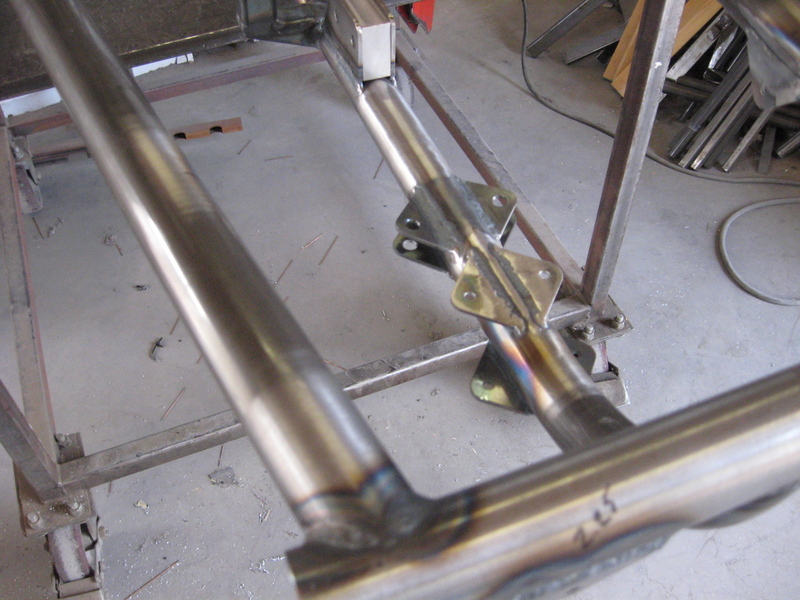 The frame is now fully “tabbed”. 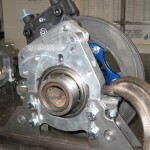 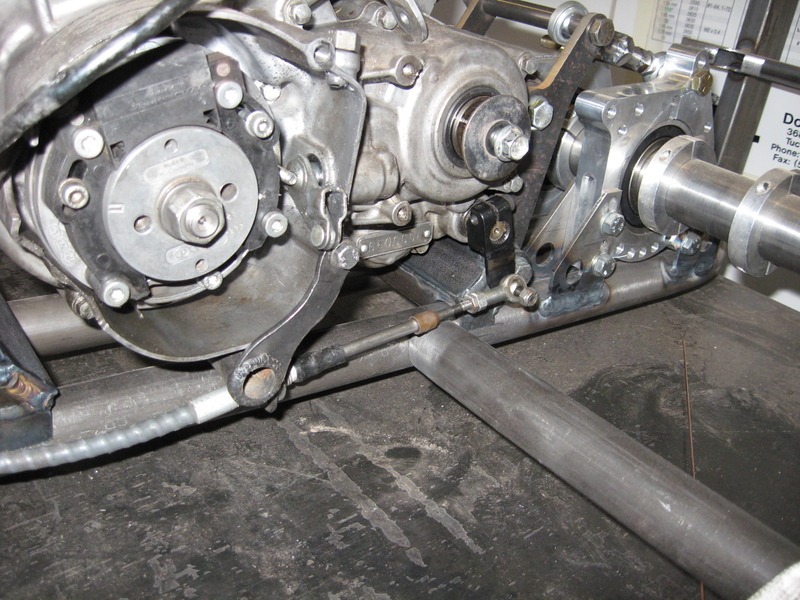 The braces are on the front spindle mounts. 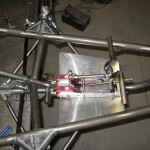 Steering uprights are on. 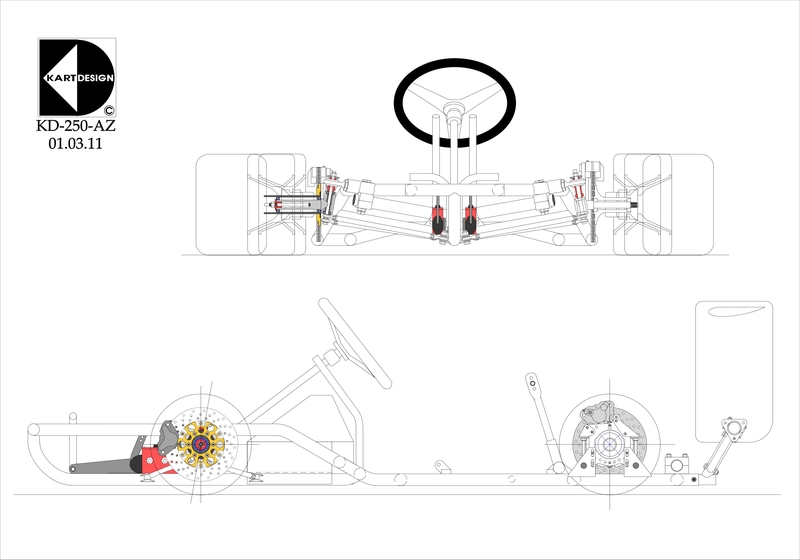 Now, more detail work. 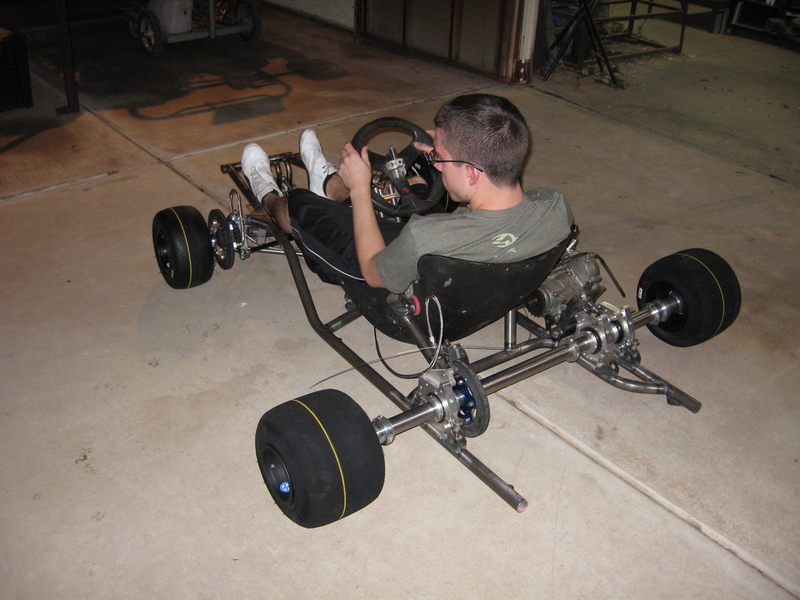 Did some mock-up work. 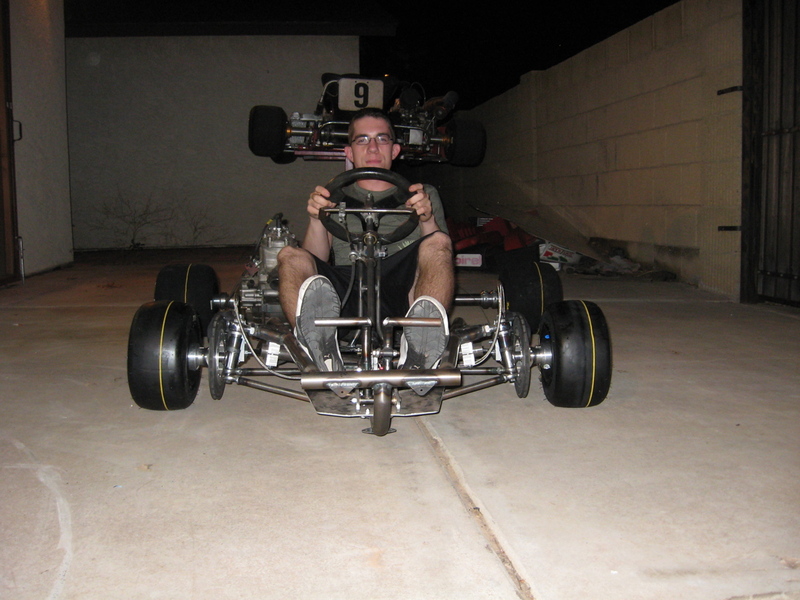 Need to figure out some good seat mounts. 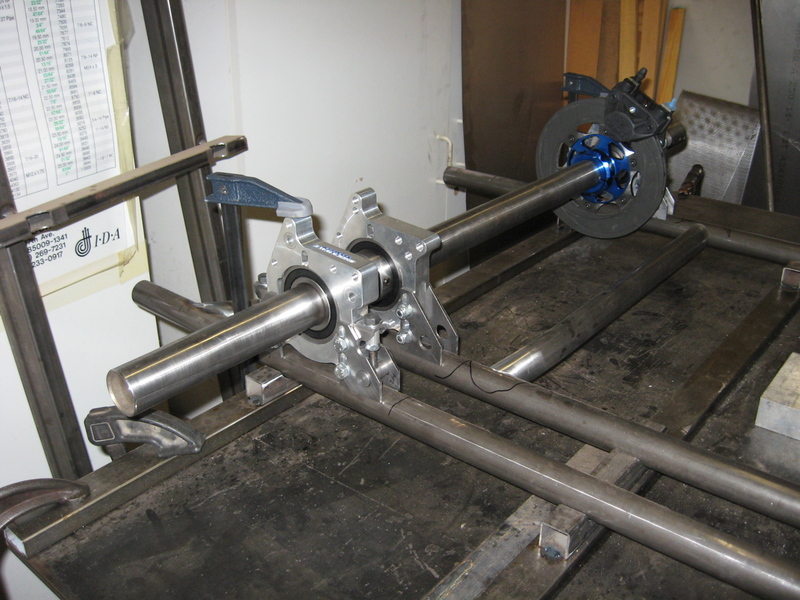 A couple of quick pictures of the front spindles. 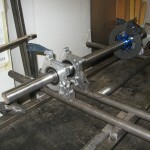 The main barrel of the spindles will be extended to the height of the washers. 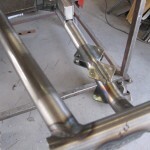 Still waiting for the metric rod end to get here, arrrggg! 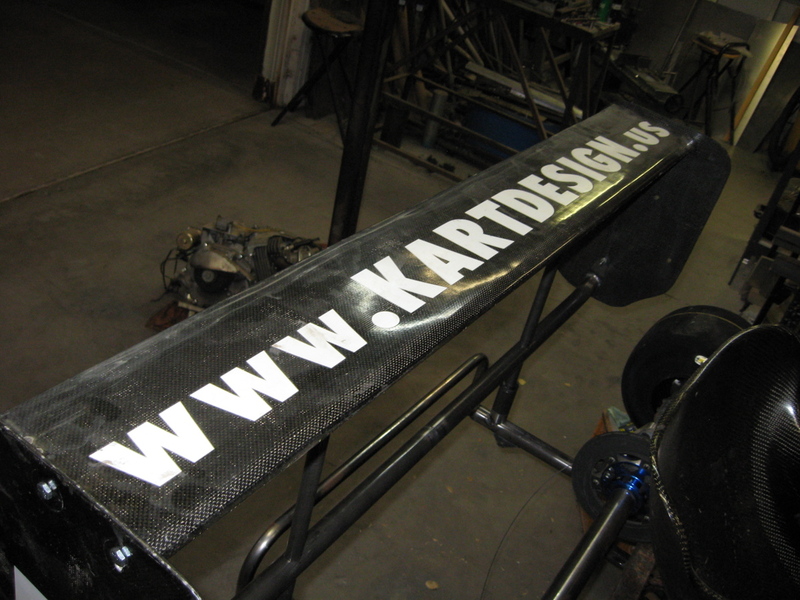 Still mocking things up. 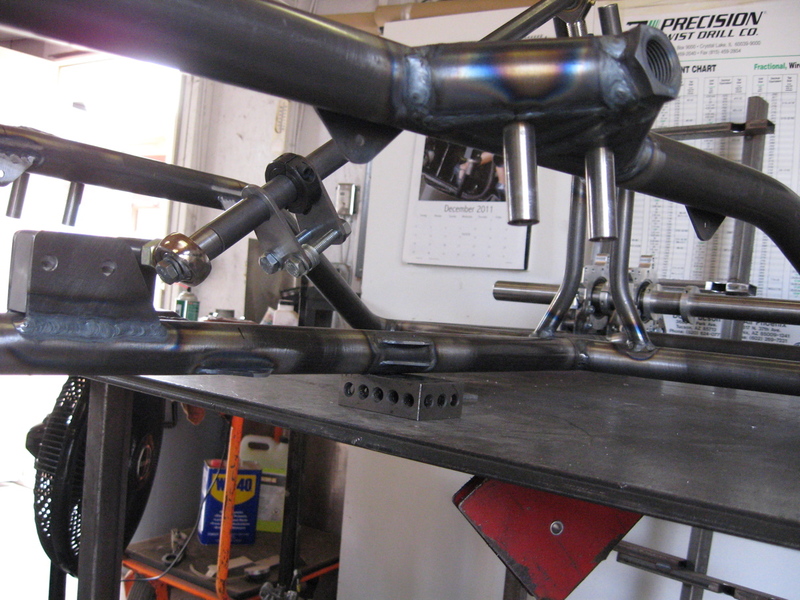 Welded the lower A-arm links, the rod ends came in, the front ride height shim stack is set. 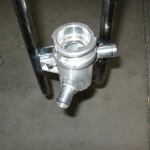 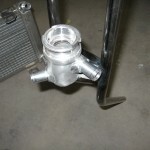 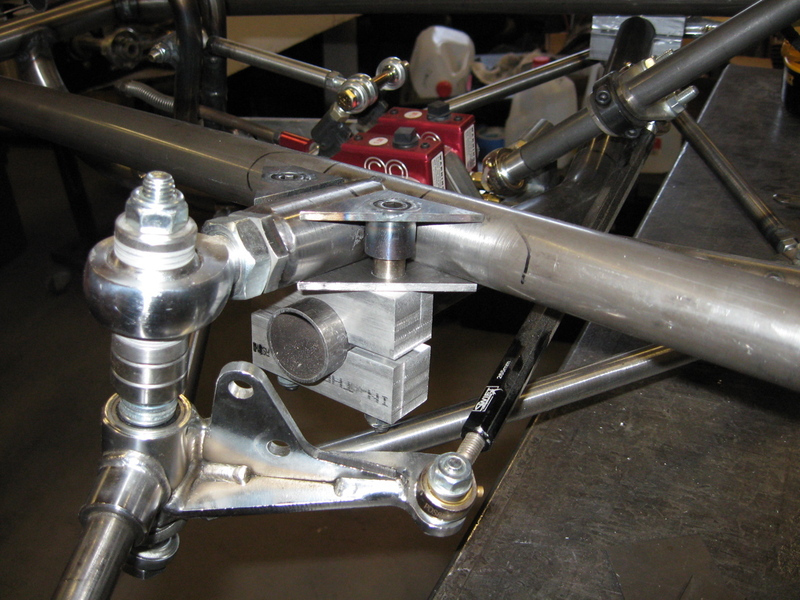 Front end is adjustable in 0.050 steps for a quarter inch up and down. 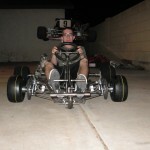 After taking a few weeks off to run our regular kart, I’m back on the Superkart. 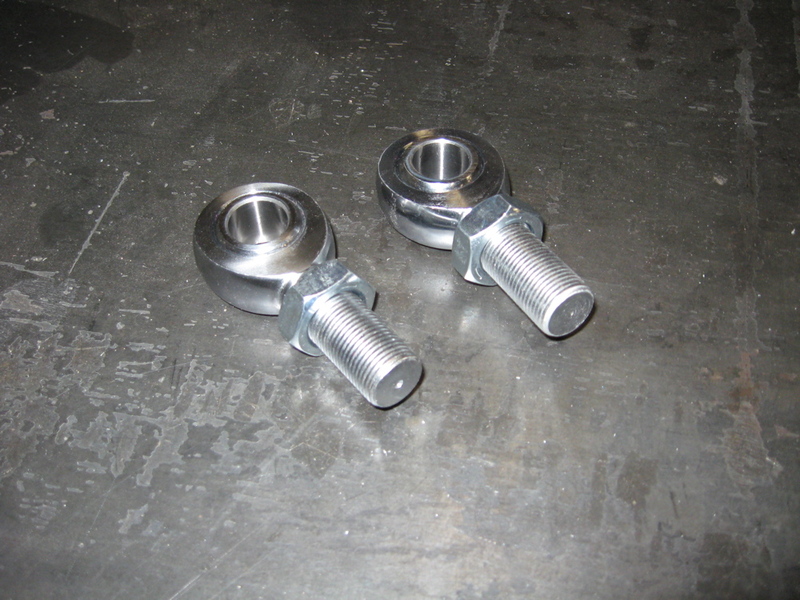 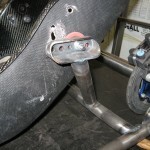 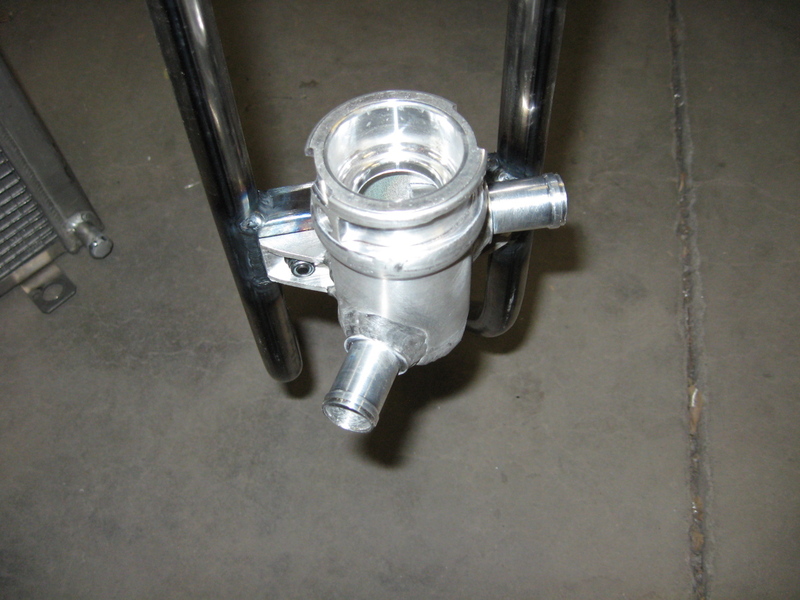 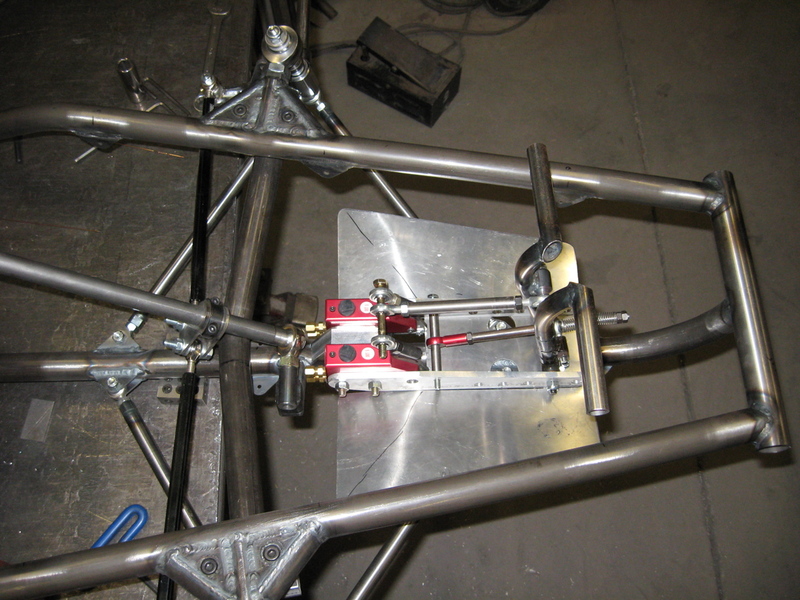 Some views of the front torsion bar mounts, steering uprights, paddle shifter, and upper shaft mount. 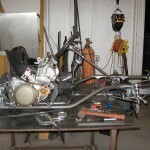 Lots more work to do. 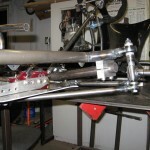 Spent most of the week working on the adjustable rear bearing hangers. 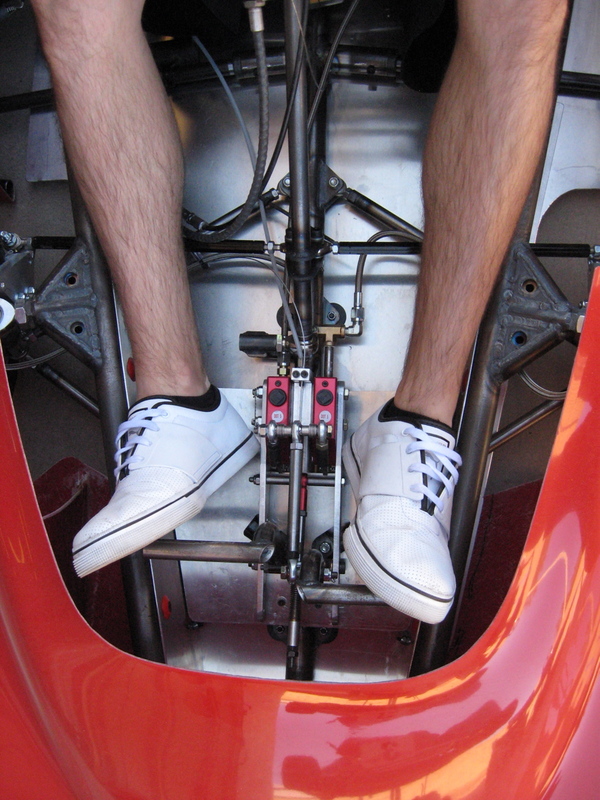 They should have almost 5/8ths of an inch of adjustment up and down. 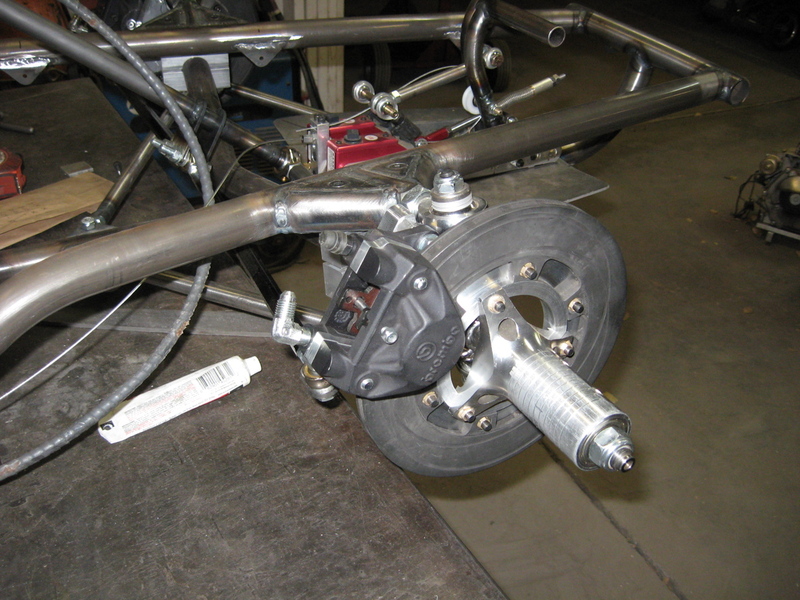 This will make for easily adjusted corner weighting and allow the use of different sized rear tires while maintaining the correct ride height. 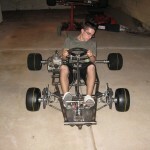 I should have some pictures tonight. 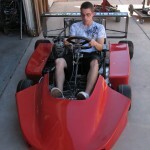 Got the pictures! 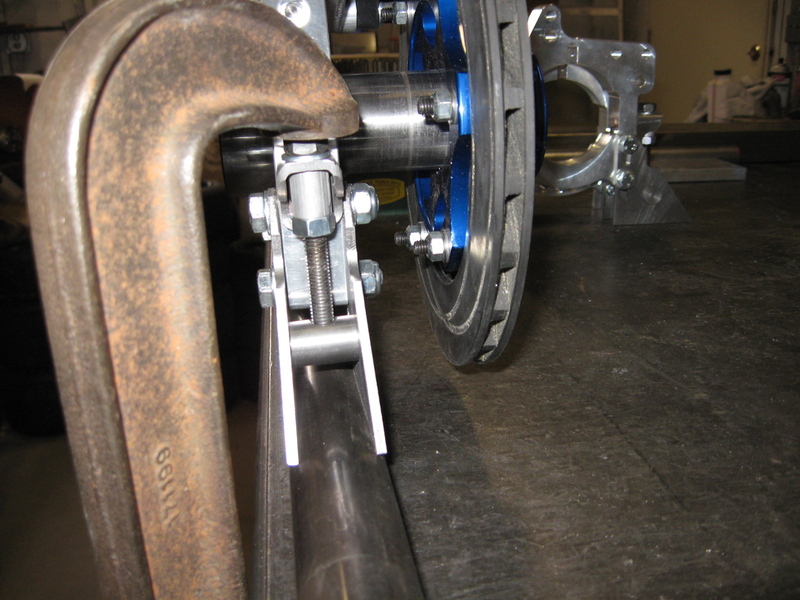 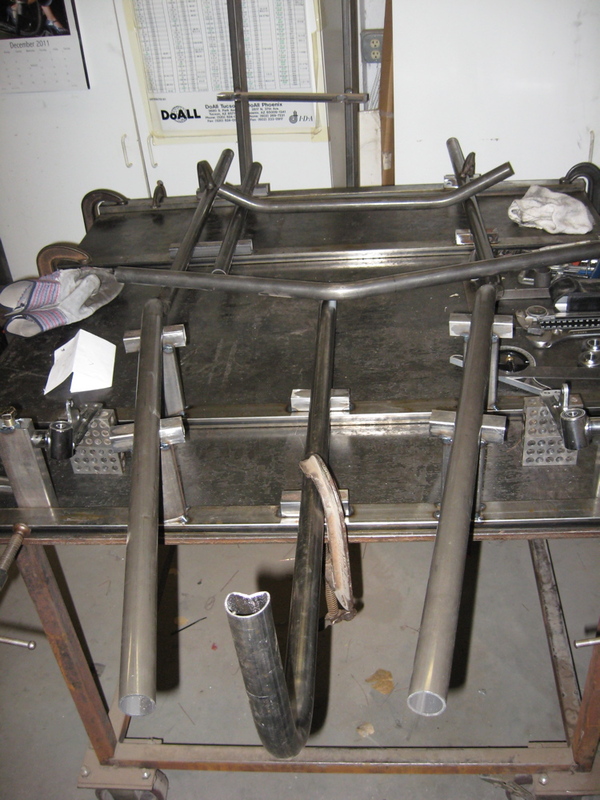 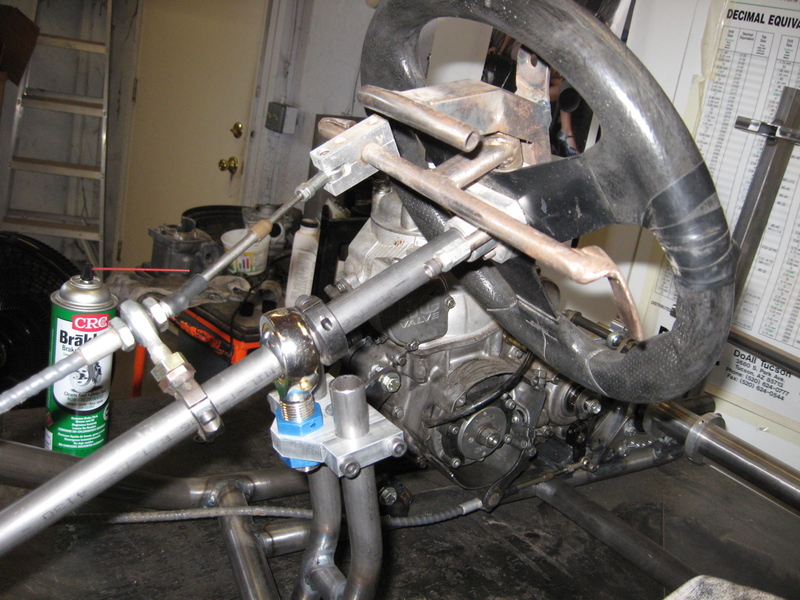 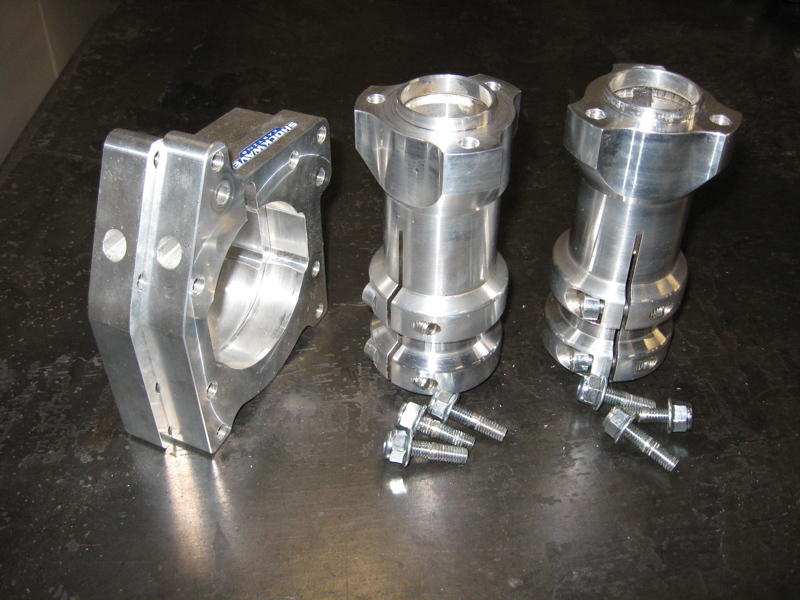 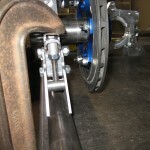 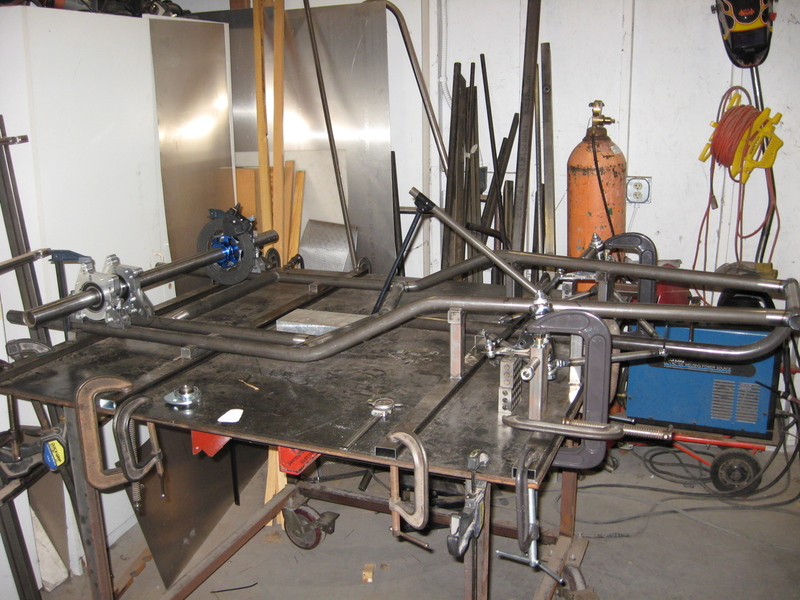 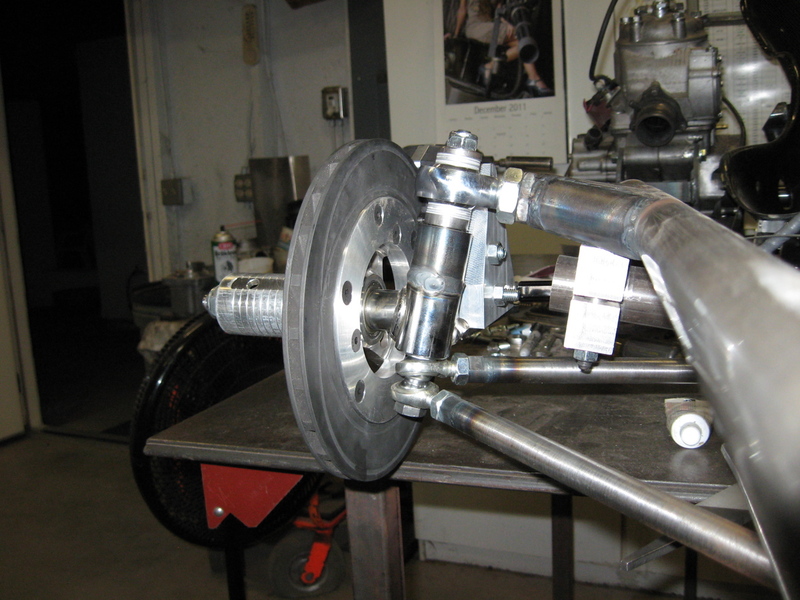 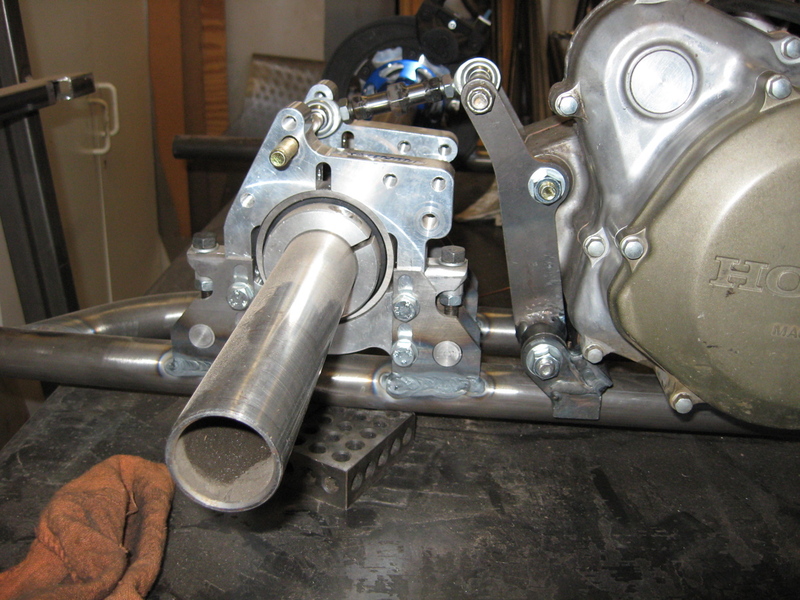 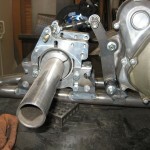 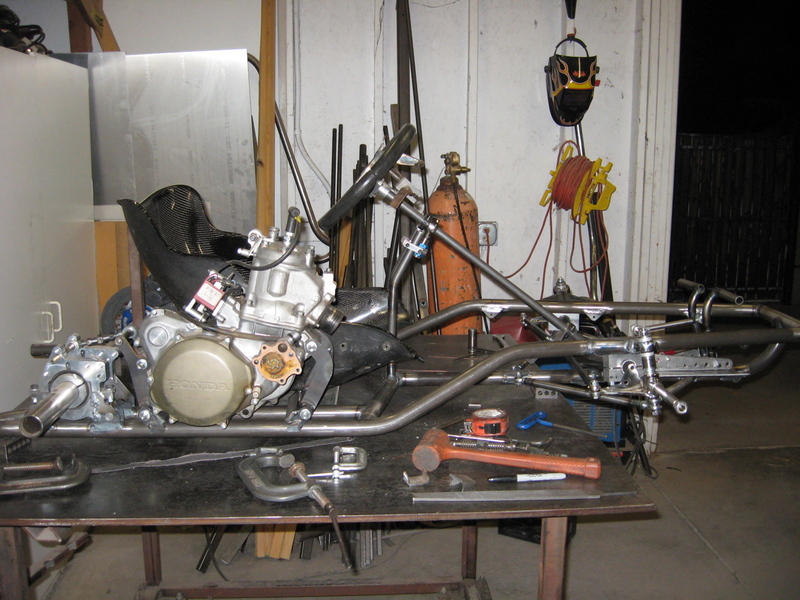 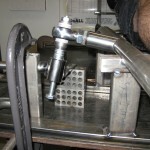 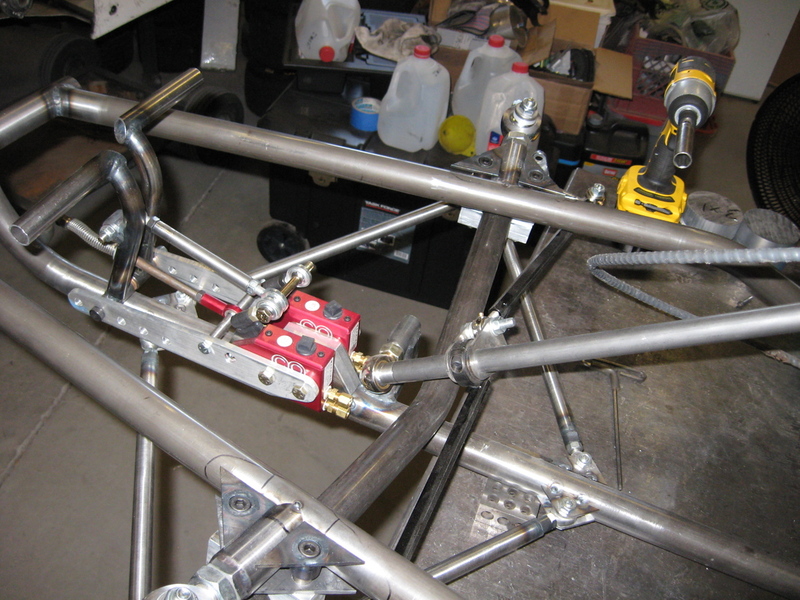 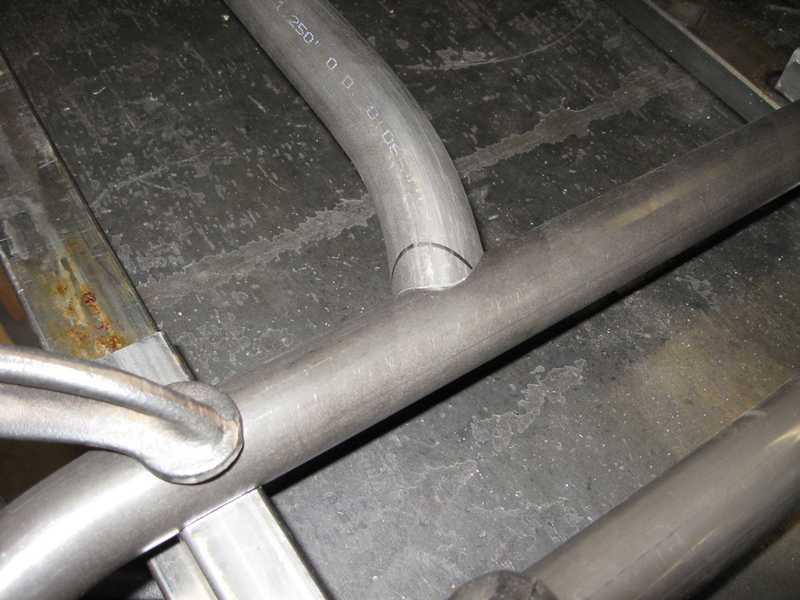 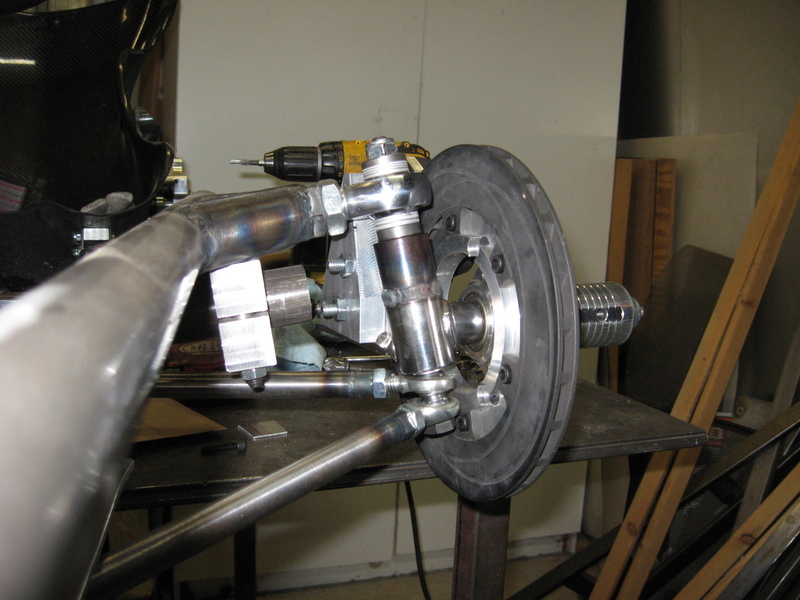 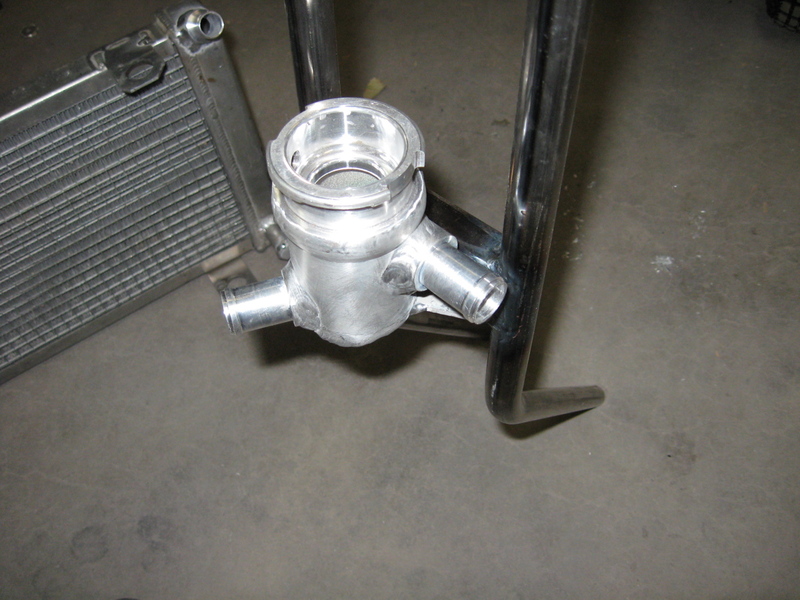 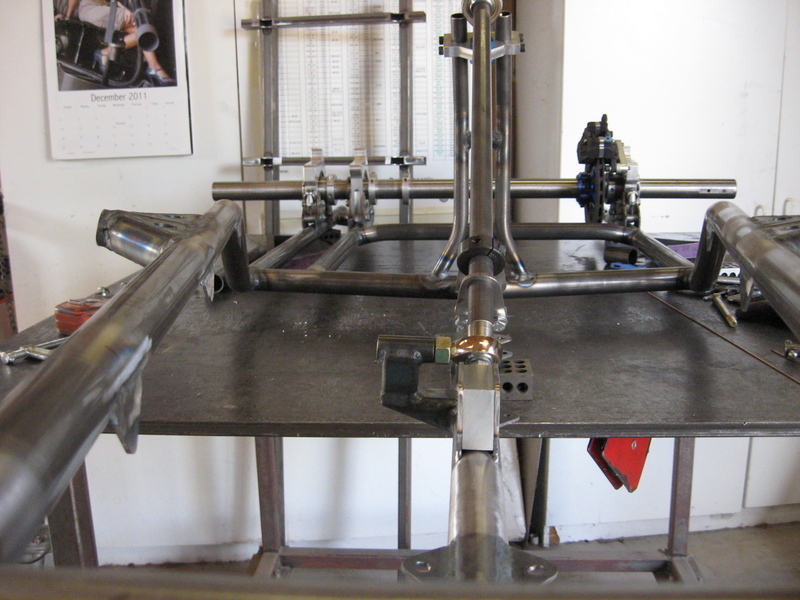 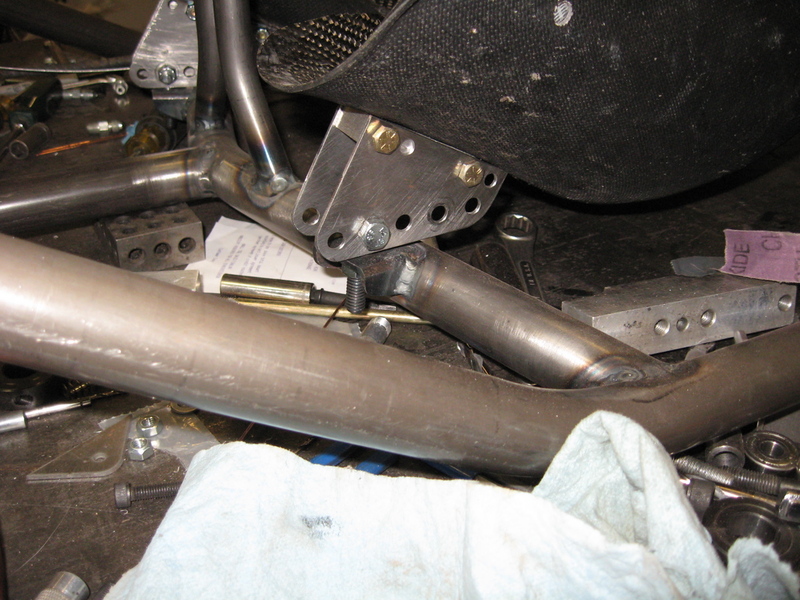 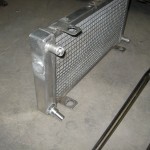 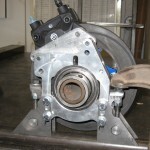 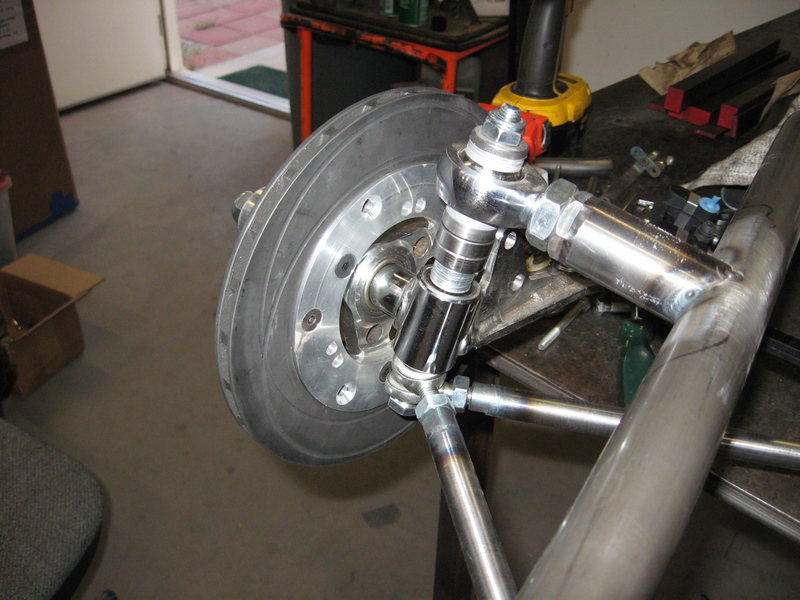 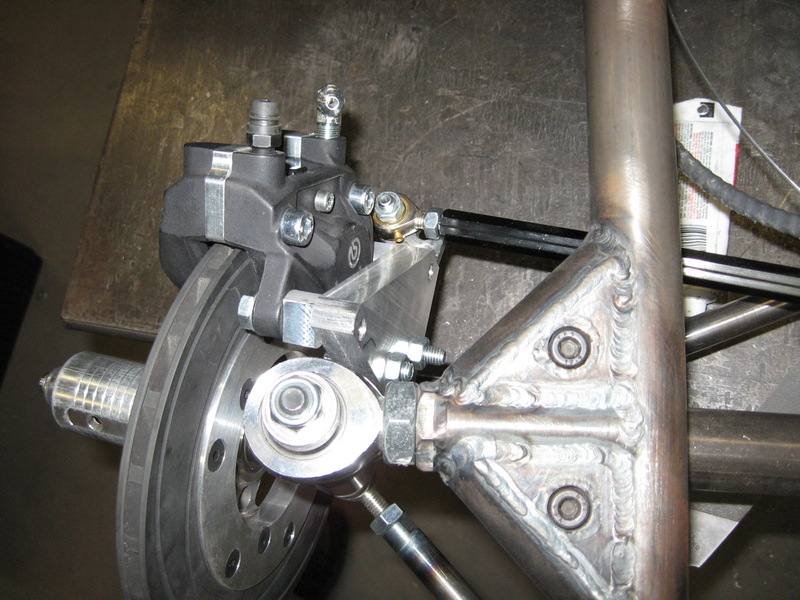 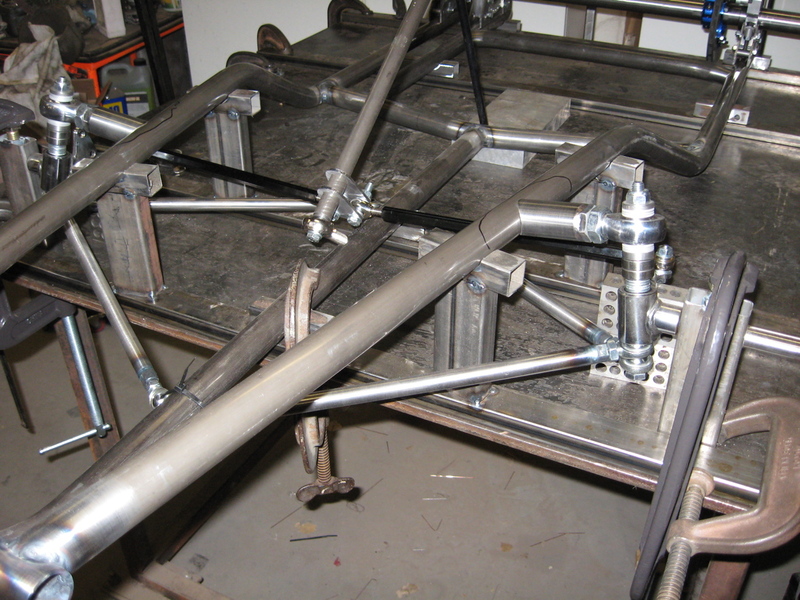 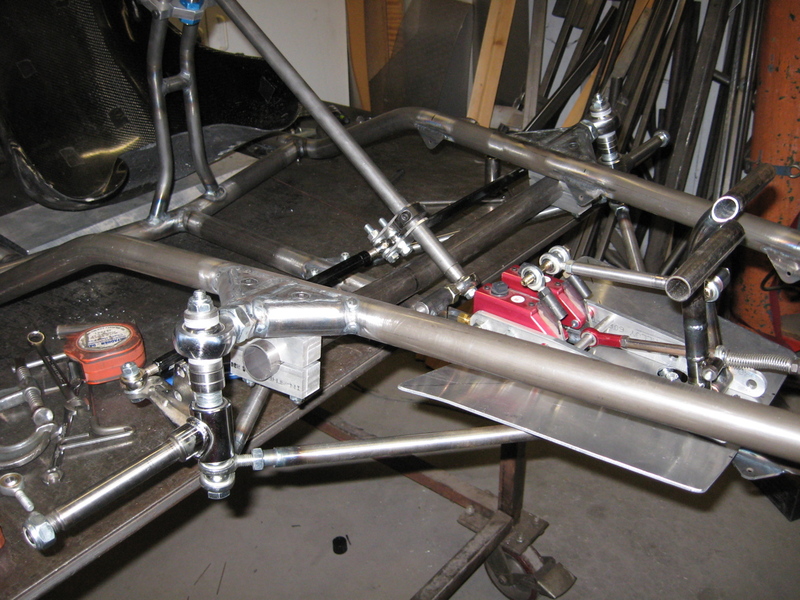 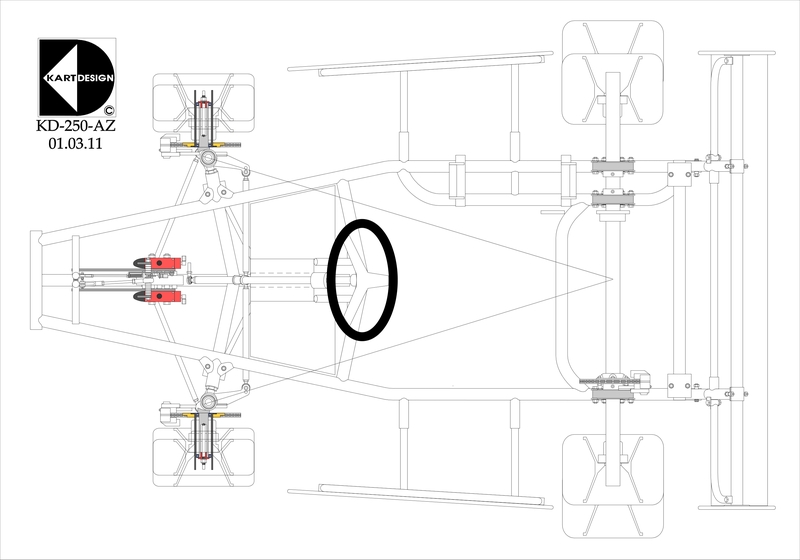 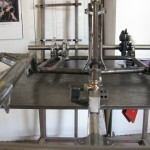 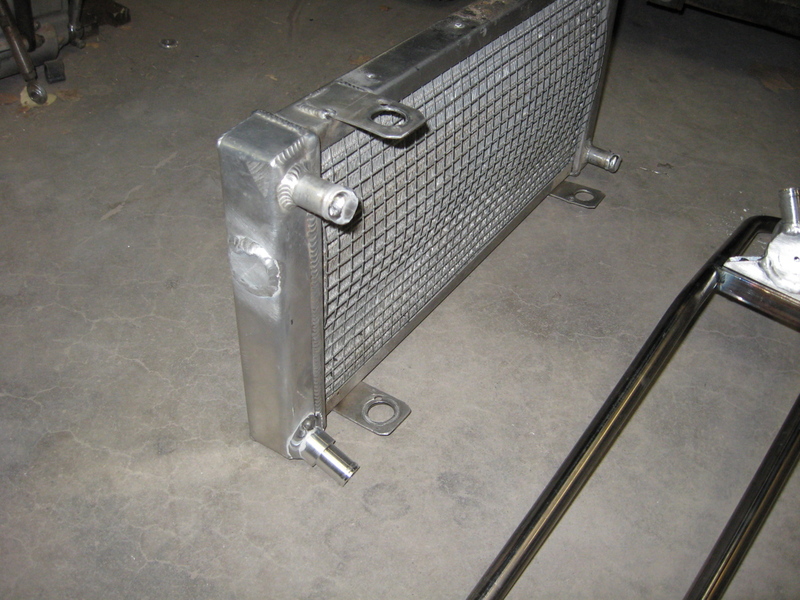 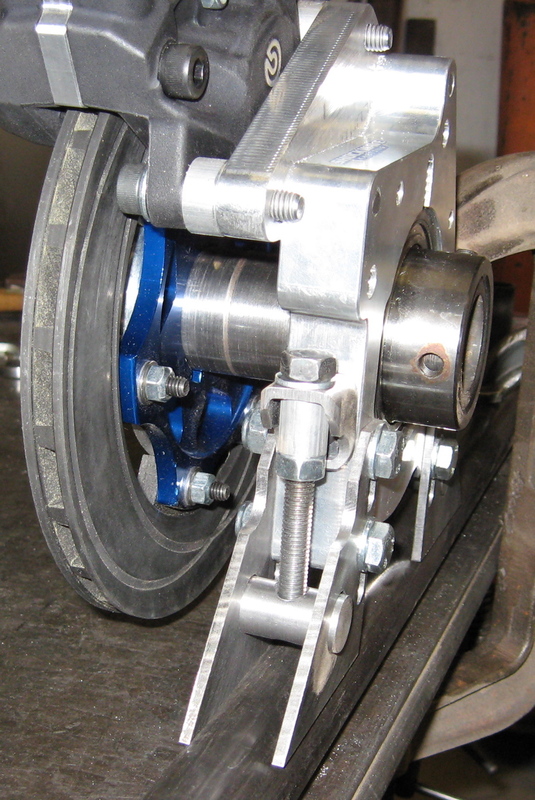 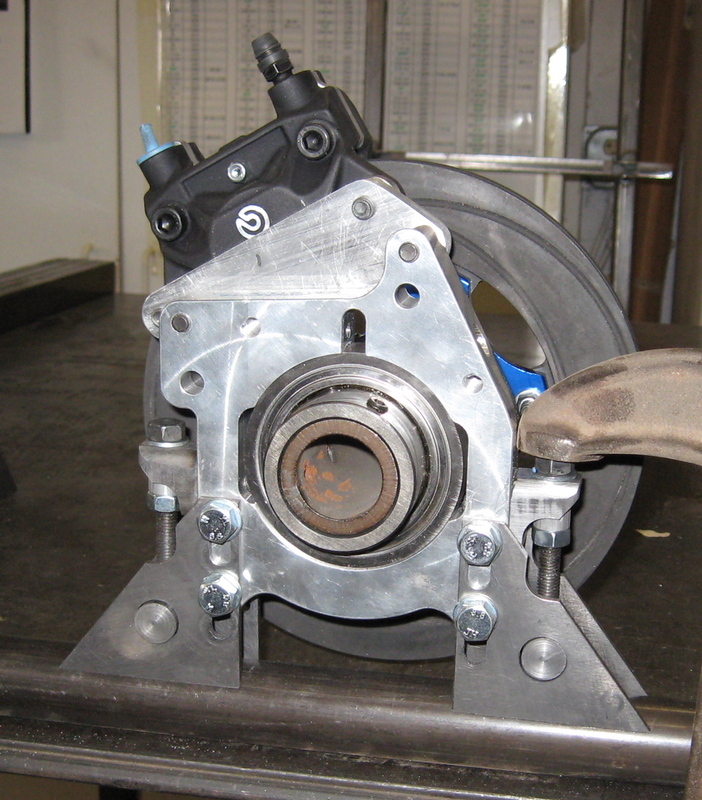 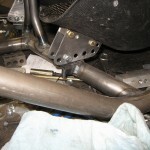 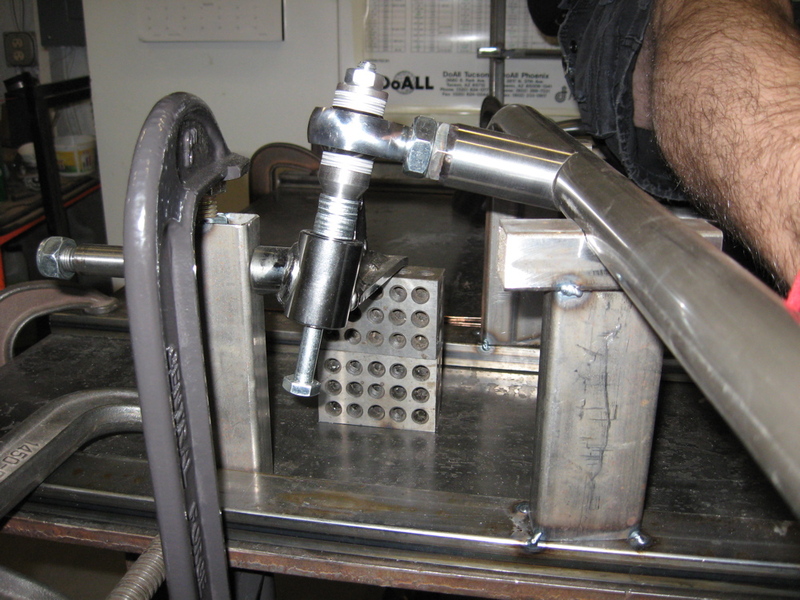 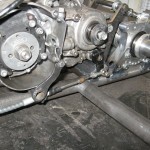 The first picture is with the adjuster all the way up – that lowers the chassis. 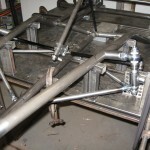 The second is the other way around – that raises the chassis. 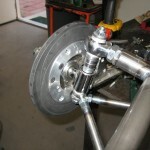 Also completed is the bracket for mounting the Brembo caliper. 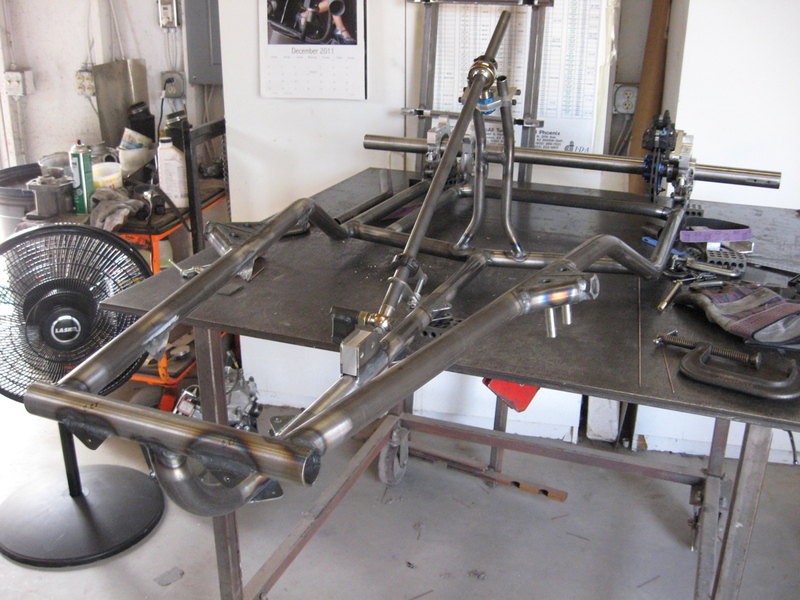 The rear end parts are mostly done, time to start on the frame jig! 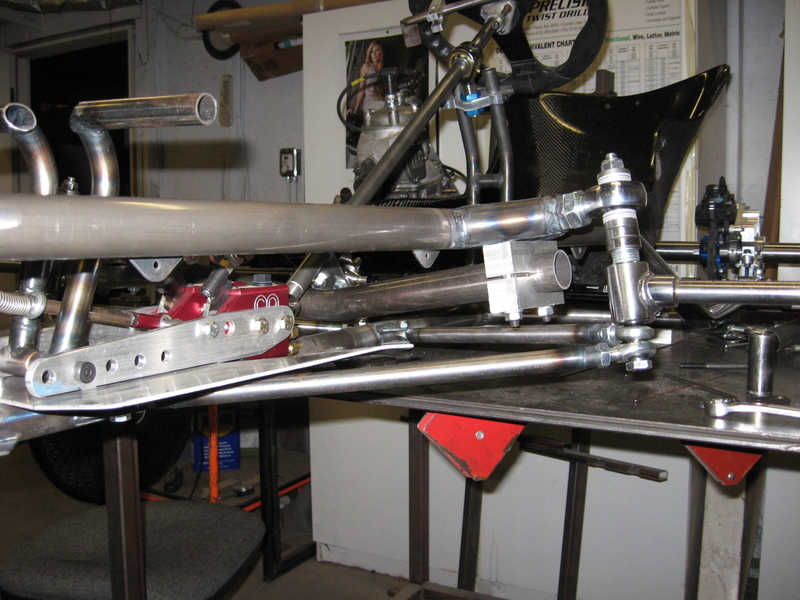 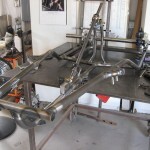 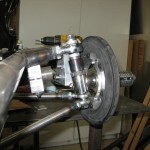 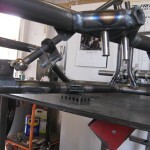 Rear axle is set in place and is just about ready for welding. 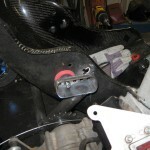 Finished the engine mount. 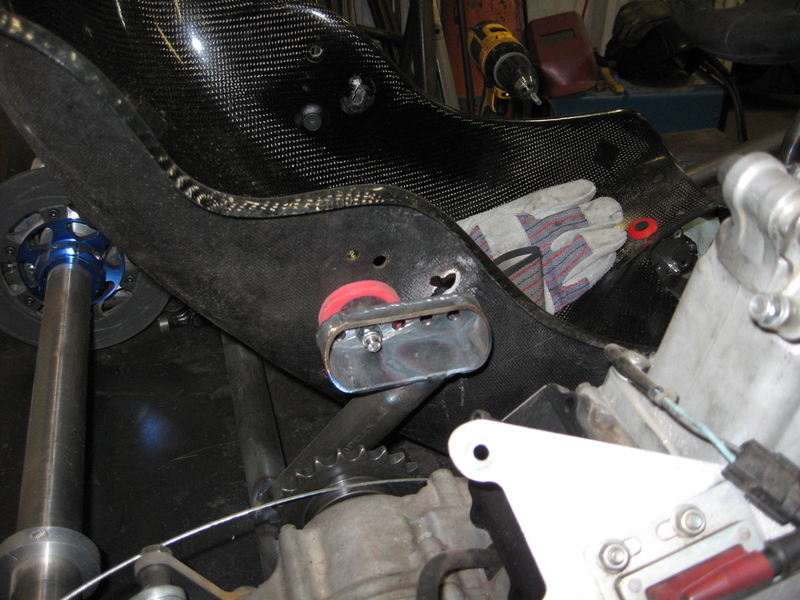 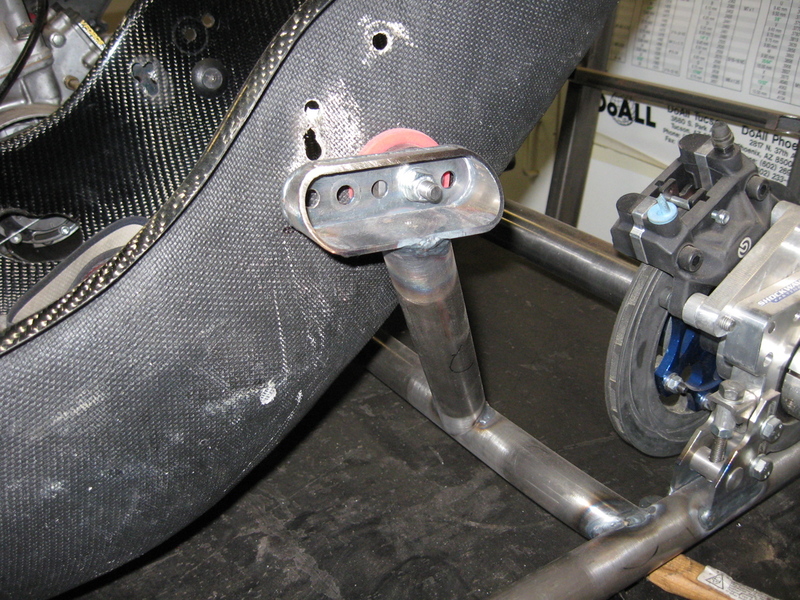 You can also see the lower shifter cable mount – got the mount off of another kart, it works perfectly. 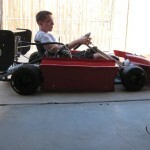 Despite the lack of updates, I have been working on the kart. 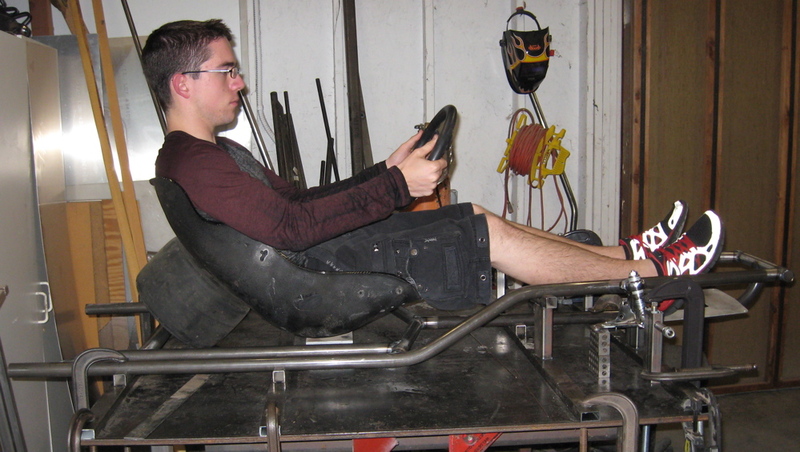 Running our regular program can really eat up the time! 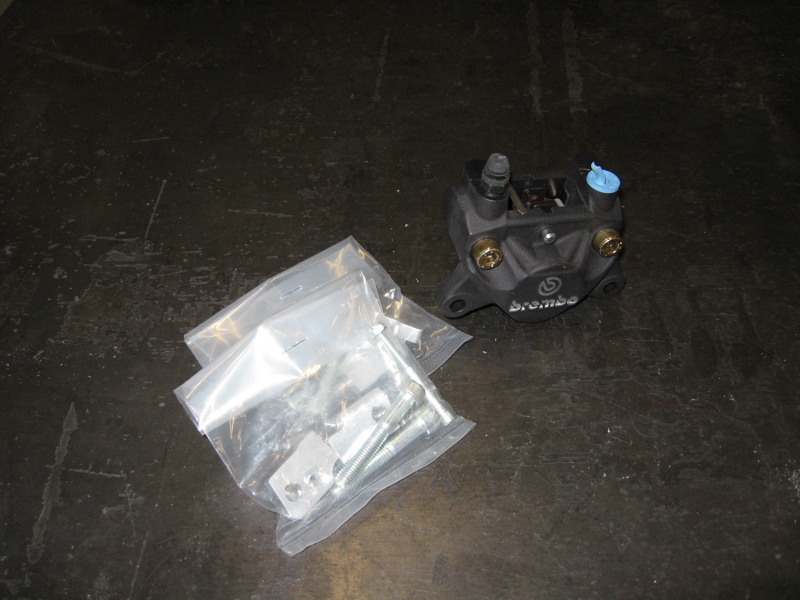 Here are some pictures of the front rotors and the master cylinder/pedal mounts. 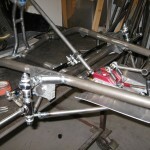 Lots of little pieces! 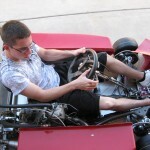 Too freaking hot to do much work! 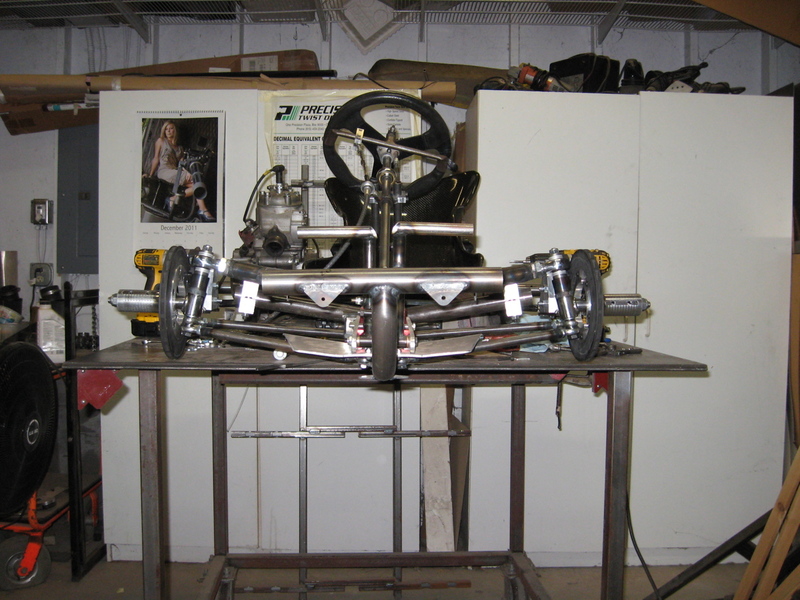 Got the brake rotors mounted, the caliper mounts made, the spindle extension welded, throttle cable mounts and pivots, and seat mounts! 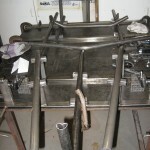 Picked up the bodywork from the Greyhound station, no problems. 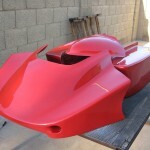 It came from Ed Shampine at New Concept Design. 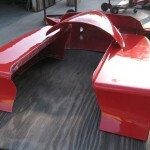 Great fiberglass and a great guy to deal with. 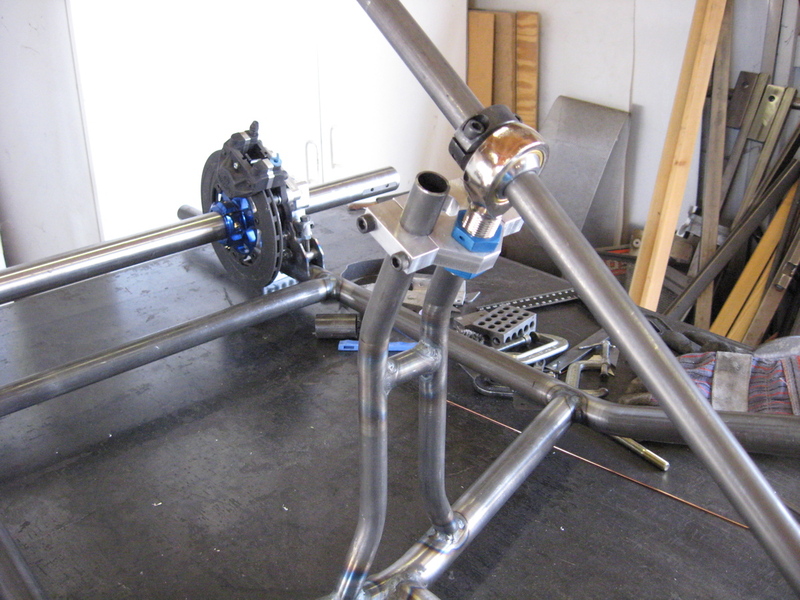 It’ll be a while until I mount this stuff but it lets me figure out a lot more stuff. 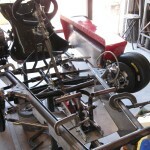 Started mounting the bodywork. 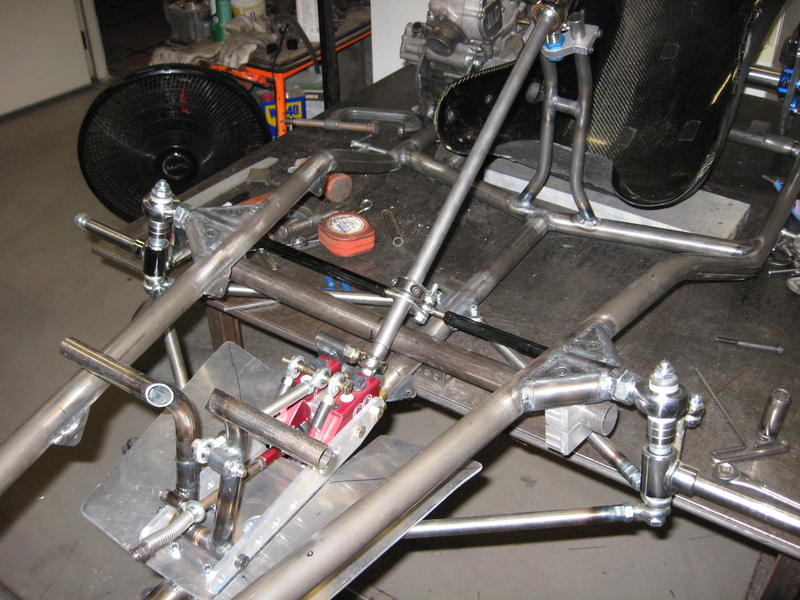 Side pods first. 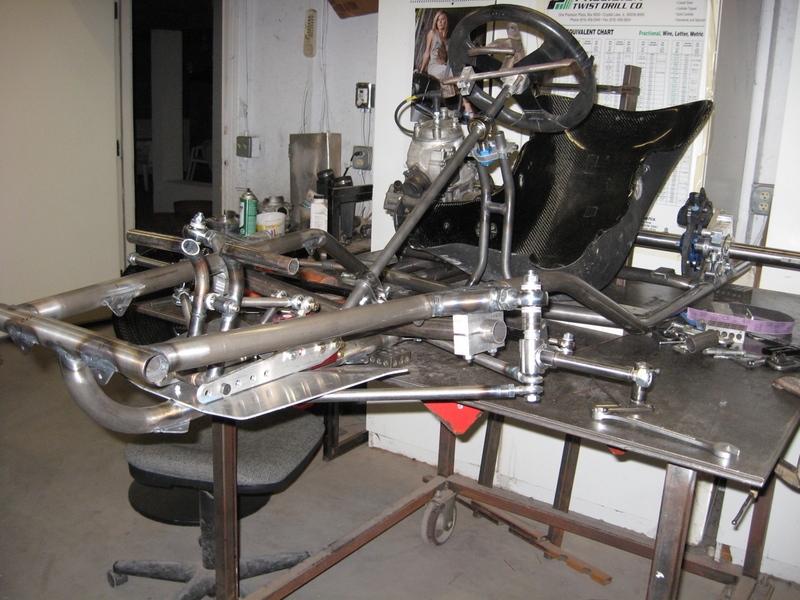 Next comes the wing and radiator, then the drivers fairing. 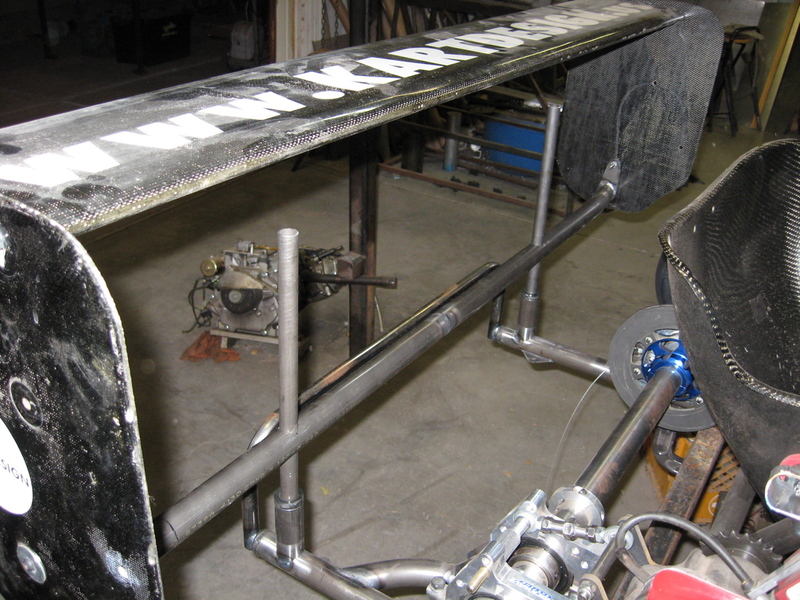 The wing and radiator mount is shaping up. 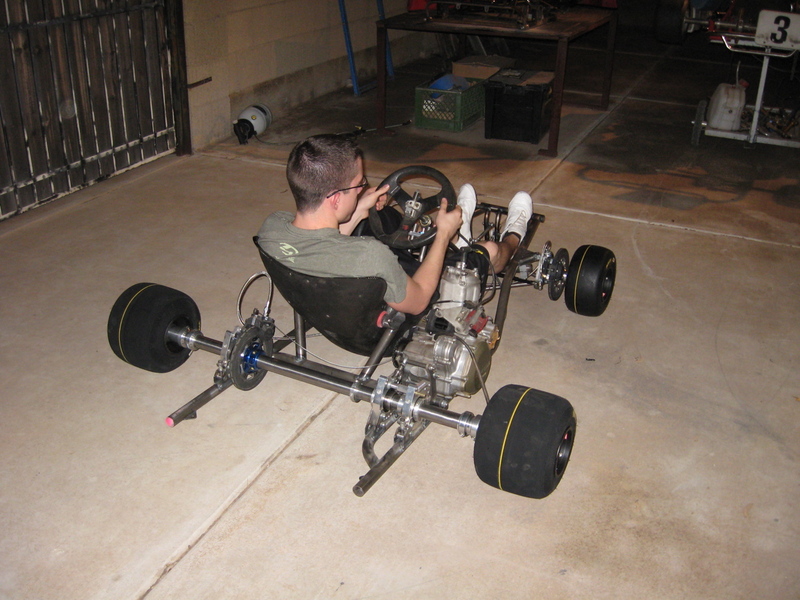 It’s a lot easier if you can use some parts over. 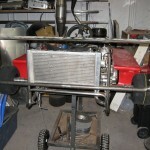 Working on the cooling system – slow going. 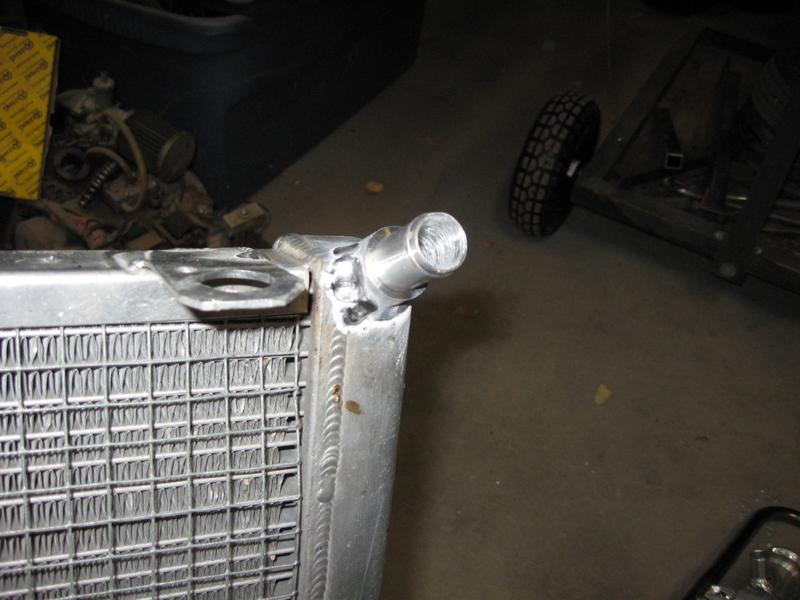 New outlets on the radiator and a pressure cap/fill point mounted on the headrest – that I’m making too! 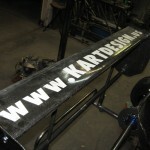 Two weeks left and a long way to go! 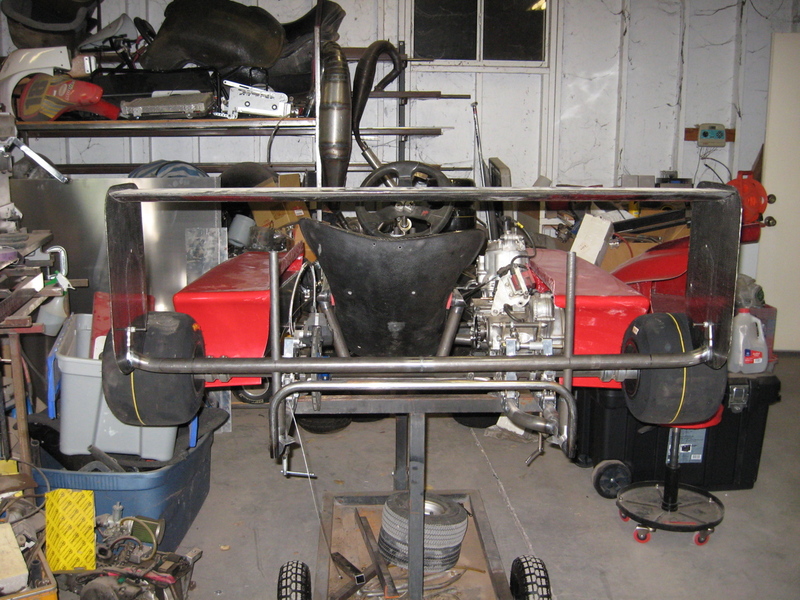 Most everything is pretty much done, just have to tie it all together. 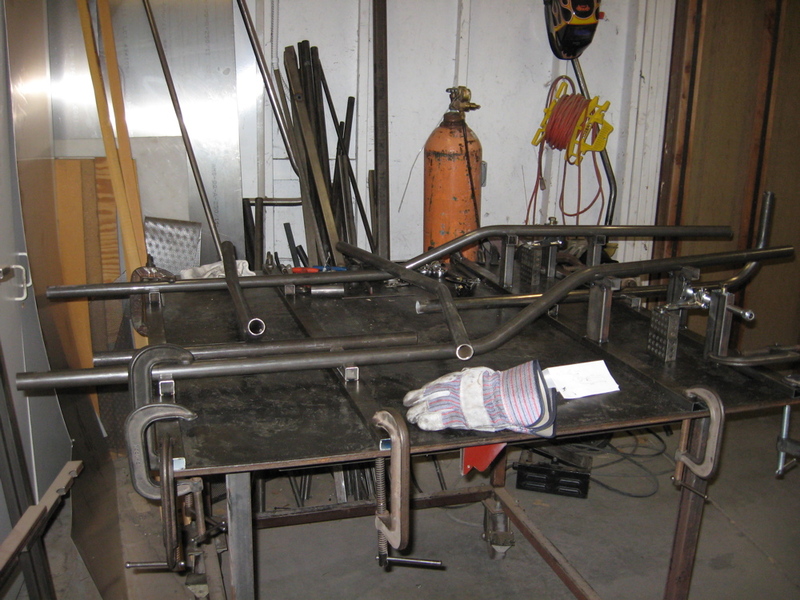 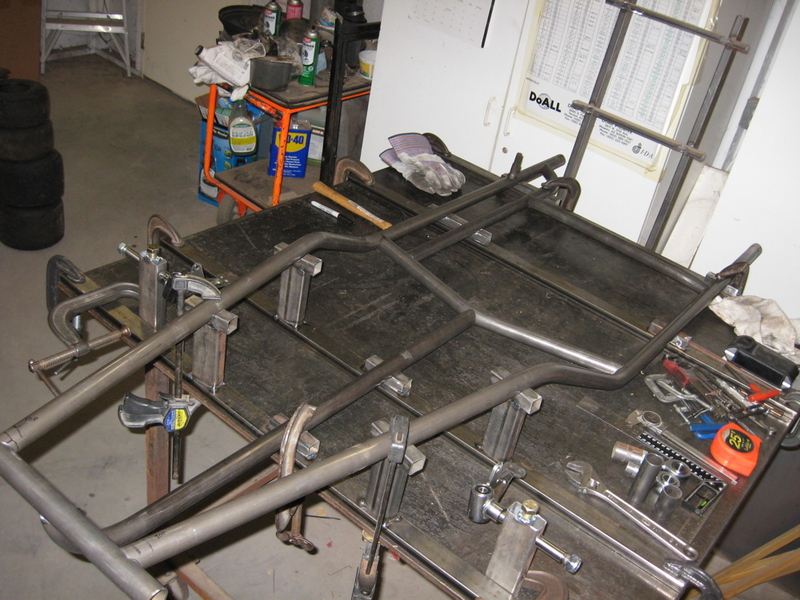 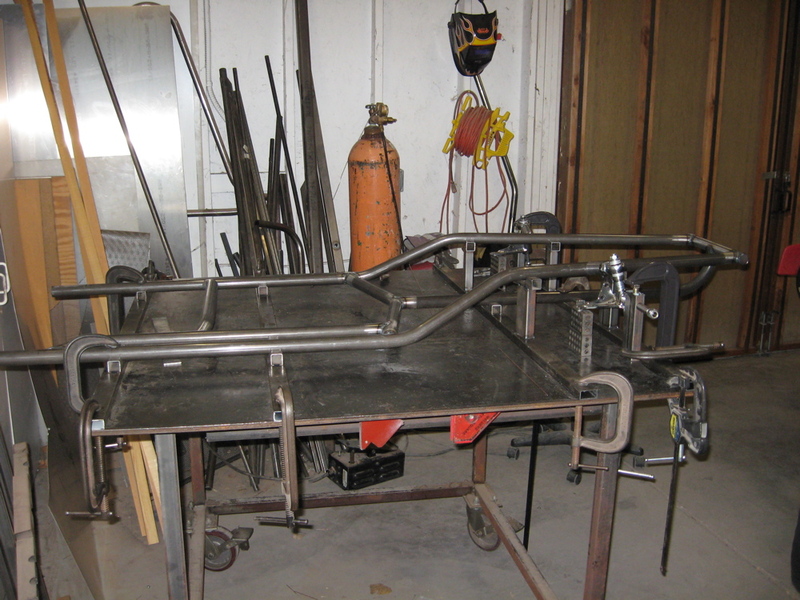 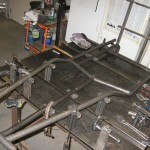 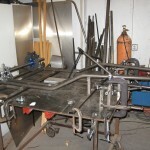 Did the final weld on the chassis. 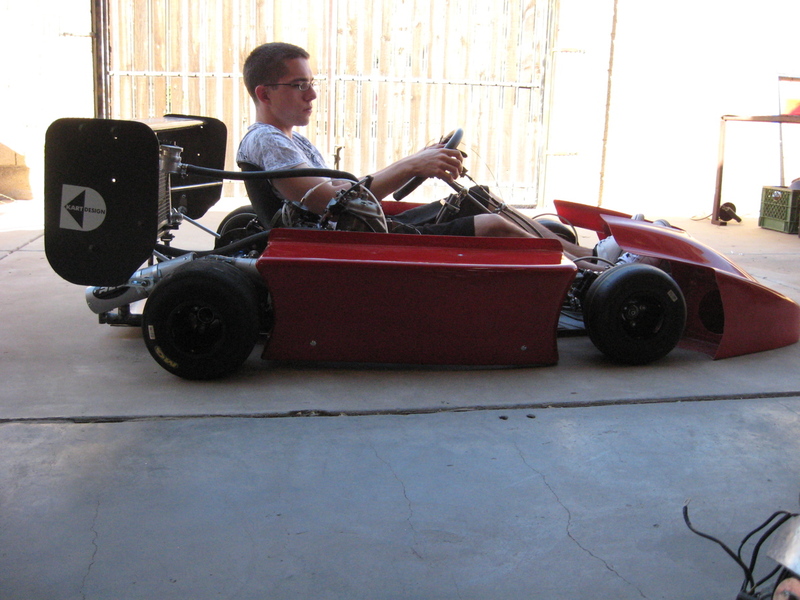 Still have to mount the nose and driver fairing. 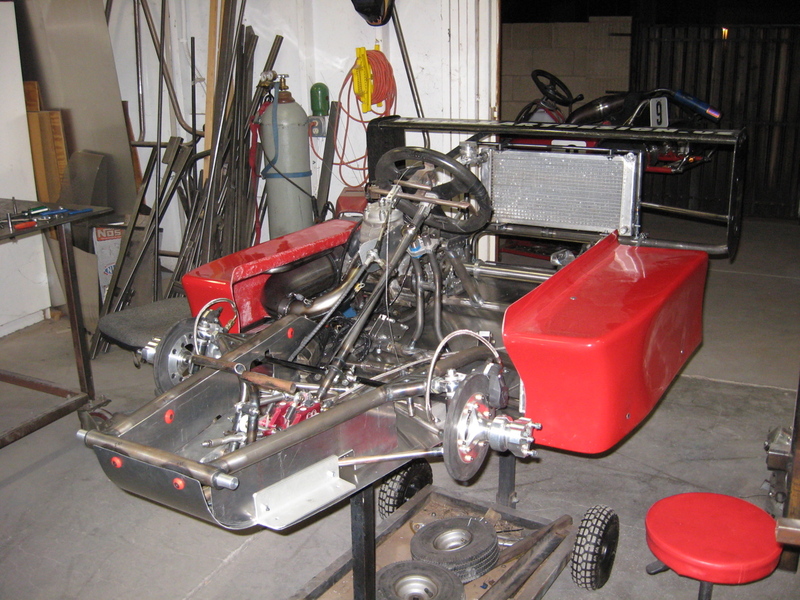 It always looks better when you put the big pieces on it, it looks more like a kart rather than just a contraption! 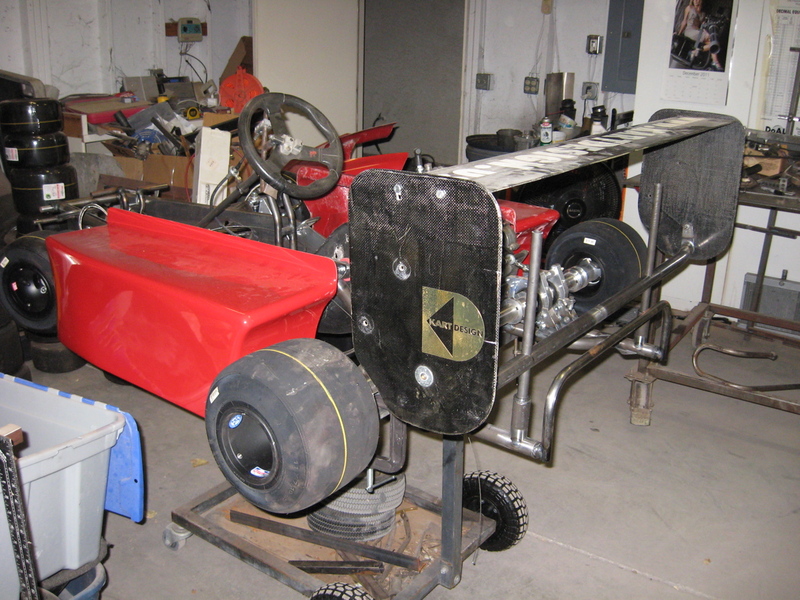 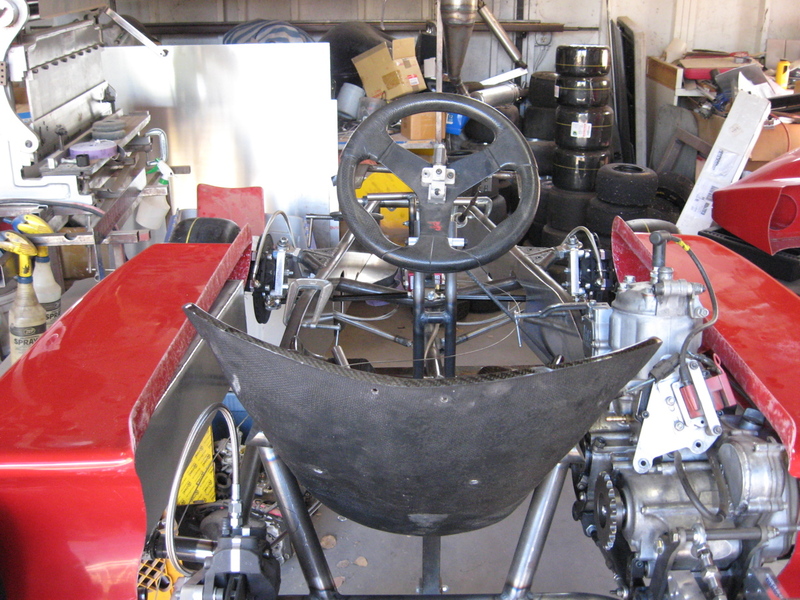 The kart is on it’s wheels, the brakes work, engine is hooked up, and the floor pan is on. 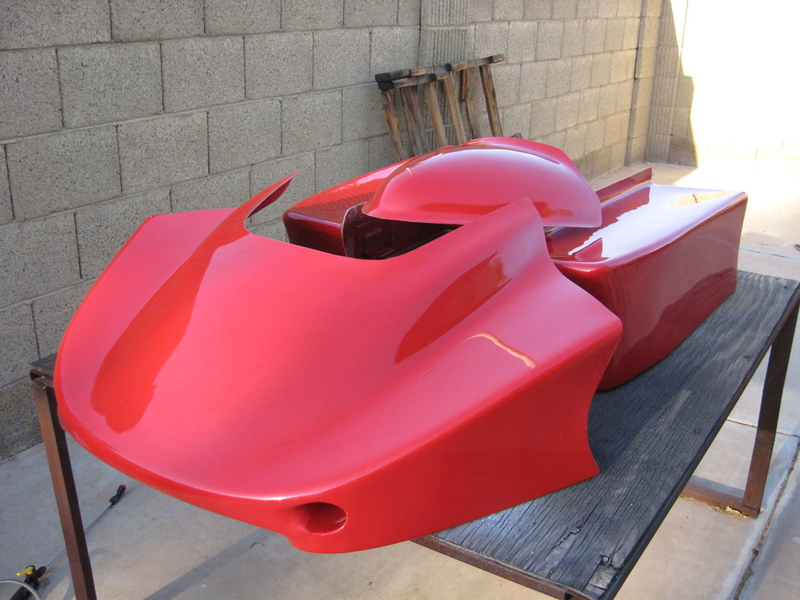 Still have to do the nose, driver fairing, and radiator scoop.